I’ve never heard anything but good about the REV3 Triathlon events. 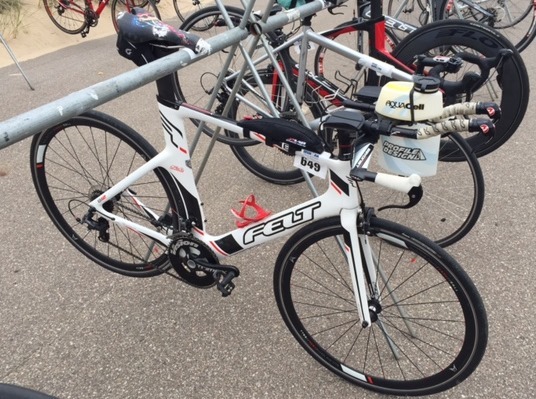 So last year when I was planning my 2016 triathlon schedule, I added the REV3 Cedar Point 70.3 to my roster. I figured it would be a great event for me & a fun trip for the kiddos. Each race entry comes with a free park pass for the weekend for the athlete & then a voucher for a $45 weekend pass for each family member/friend who accompanies you on the trip. Win, win! Rev3 is notorious for putting on a series of events to include the entire family. 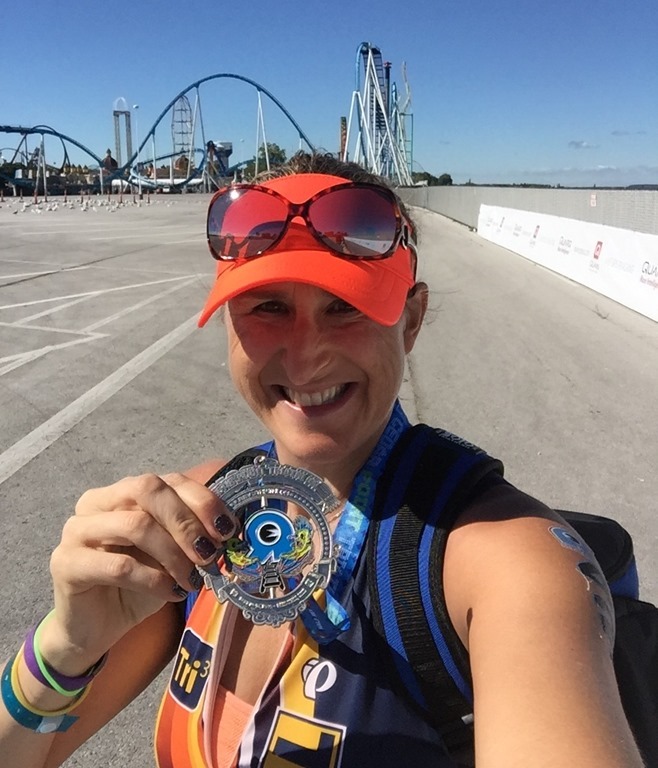 This weekend at Cedar Point they did a Sprint & kids triathlon on Saturday, then a full & half iron distance triathlon & a GLO run on Sunday. All events, plus the expo started in the Cedar Point parking lot in front of the park. The expo was small. Packet pick up was smooth. The race meeting was informative. Then off to the park with my munchkins. Saturday was extremely windy. 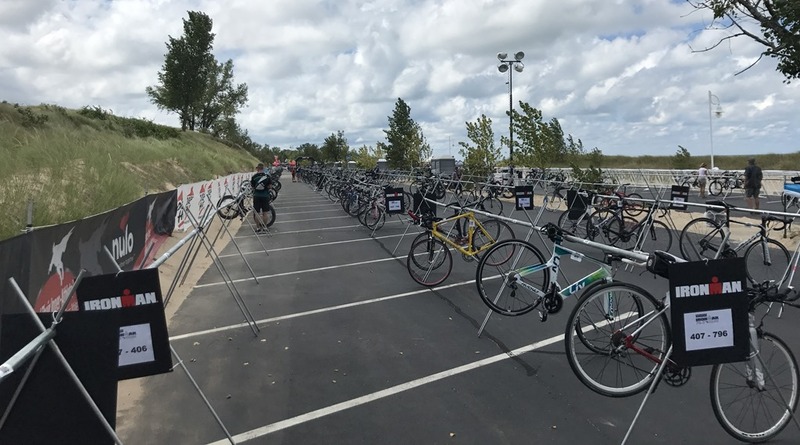 Thankfully they waived the mandatory bike check for the full & half athletes. I was seriously concerned that my bike would blow away overnight. It was difficult to roll my bike thru the parking lot on SAT, I wasn’t sure how to anchor it in transition. Fortunately, I didn’t have to worry about it. But then I had my bike in a hotel room full kids. Made things a bit tight but they rolled with it. However, getting it back to transition on SUN morning wasn’t fun. We were told that the best way to get to transition was down the beach from the hotel. 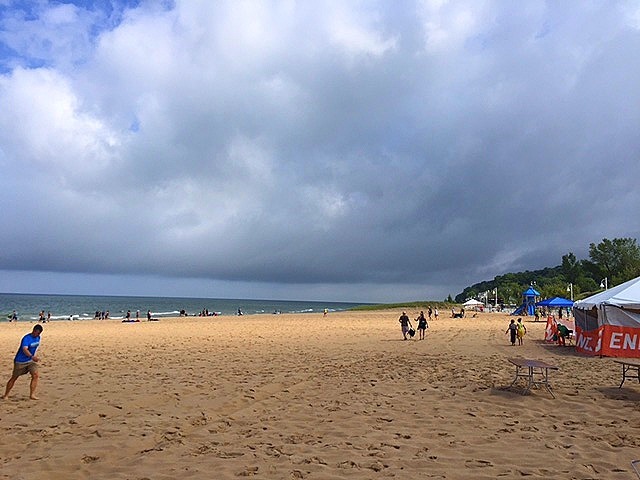 I didn’t realize that the boardwalk ended shortly after the hotel and that I’d really be hiking the beach …. with my bike …. and all my gear. 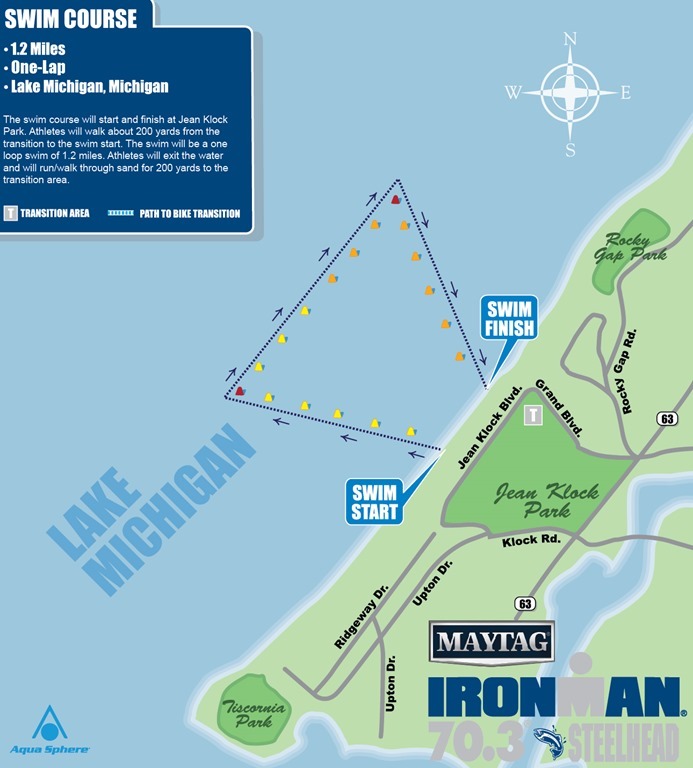 Due to that famous wind, the swim start had been moved from Lake Erie (in front of the Breakers Hotel) to the Cedar Point Marina. I wasn’t really sure why. The water looked calm to me. I mean, honestly, I’ve been swimming in Lake Michigan all summer. 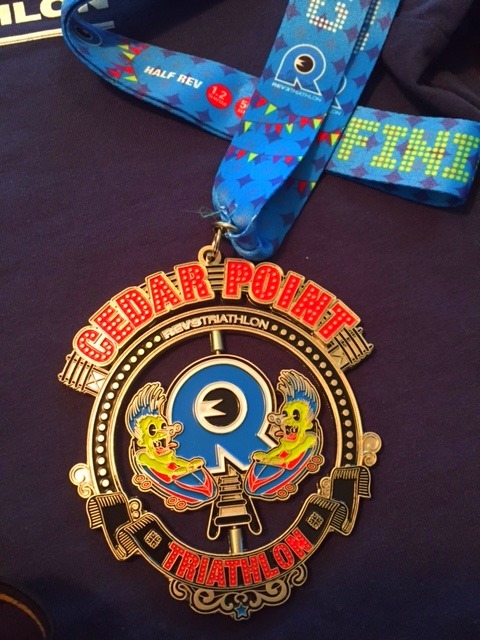 I’ve raced every event except Cedar Point sans wetsuit. Lake Erie was calm. 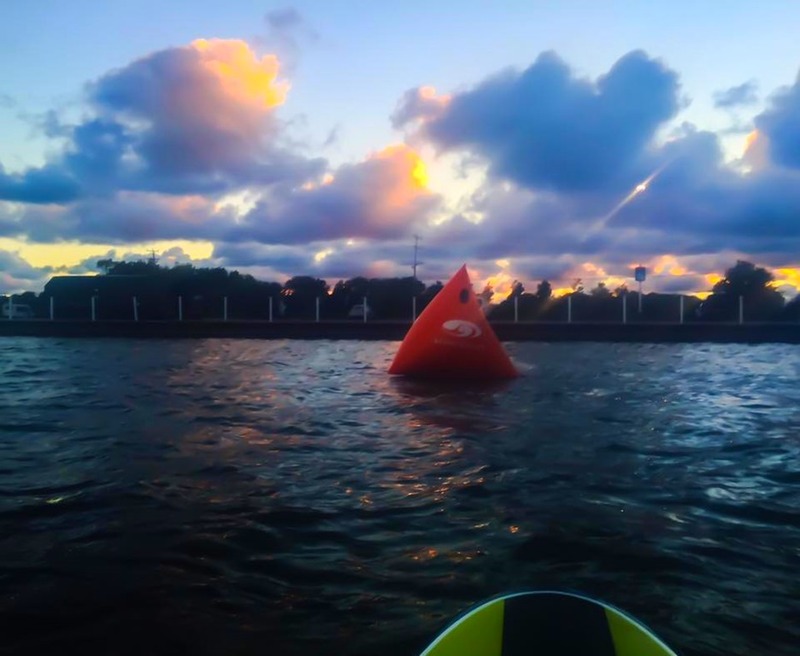 Rev3 said they couldn’t’ secure the buoys in Lake Erie without them floating off to Canada. 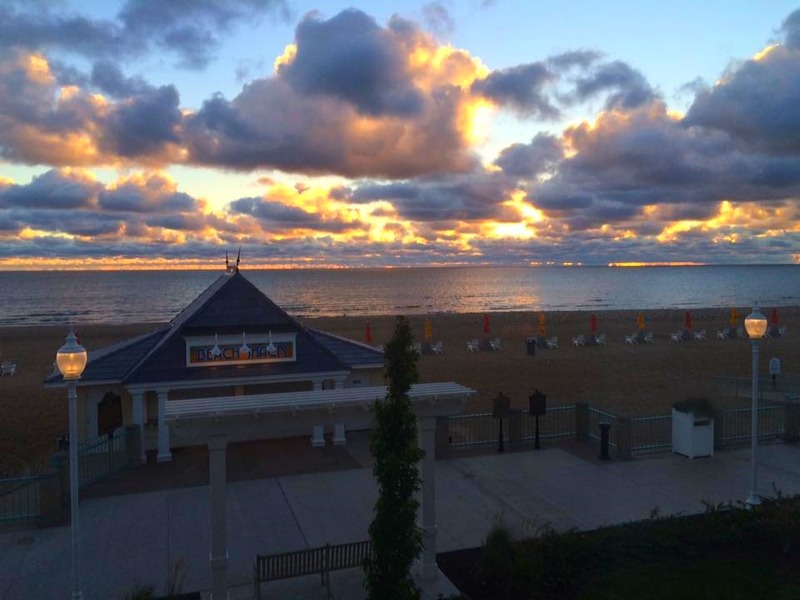 Pic from the Breakers Hotel of Lake Erie on race morning (courtesy of David Standley). So the Marina swim it was and the water there was very calm and very warm. 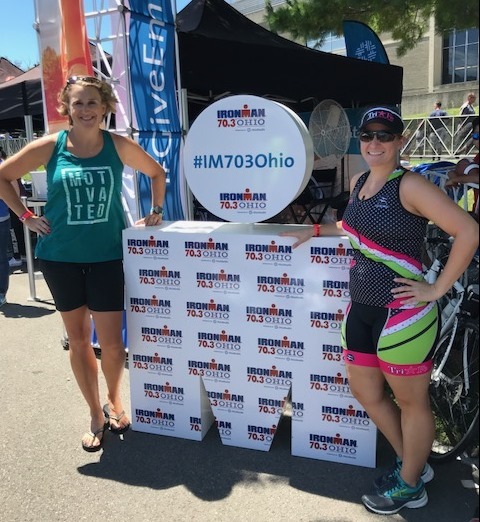 I would hazard a guess that the water was too warm for wetsuits BUT I race mostly Ironman events which has a lower water temp limit (76.1 degrees) verses non IM branded events who use the USAT limit of 78 degrees. Regardless, I was warm. Pic of the marina water by Jill Kromer. Rev3 had wetsuit strippers who helped us out of our suits (and me off the ground when I couldn’t get up). Nice touch. 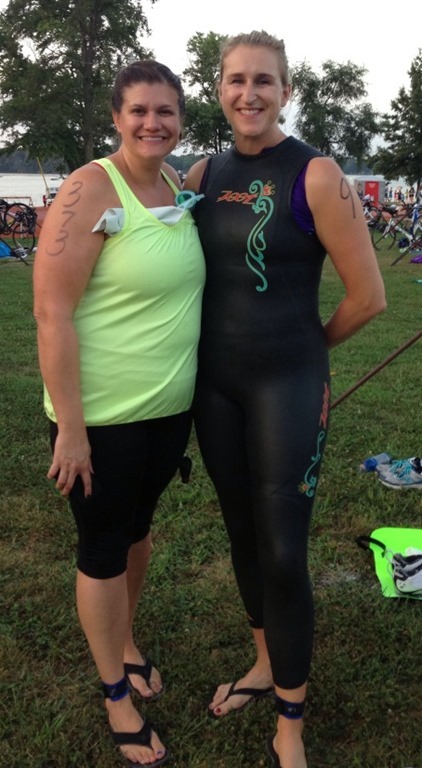 Then we had a half mile run back to transition with our wetsuit, goggles & swim cap. Fortunately, some Rev3 Cedar Point alums warned us about this possibility and I had a pair of extra shoes to put near the swim start. Yes, there was a whole staging for shoes, by race numbers, at the swim venue. Onto the bike. This was the part for which I was most nervous. If you read the last post, you know that I haven’t trained much in the last month. My bike has been broken on & off all summer but Felt finally sent new shifters and the bike was ready to roll. But my body wasn’t ready. Long story short, I’ve been going to physical therapy for my back. They believe that I have at least one disc that is bulging from the front and the back of my spine. So instead of a circular disc, they think it is now oblong, like an oval. Then to make things extra fun, its pressing on some nerves & causing issues with my legs, lack of power on the bike, etc. I’m sentenced to 6 weeks of therapy before insurance will pay for the MRI, then after that, I can see a pain specialist for injections to reduce whatever is left of the swelling/pain. For now, I live with it. Rev3 was my last ride of the season & I’m not allowed to ride or swim til we get this all figured out. First 5 miles on the bike away from Cedar Point was rough. Bad road. Nobody will admit to owning it so Rev3 can’t find anyone to repave it. Same route for the last 5 miles. Most of the first half of the ride was with the wind. I was moving pretty well. Got loose a couple times in the wind & actually thought it would sweep me away at the bottom of one hill where there was an opening in the trees on both sides of the road. Good news, I didn’t crash. Lots of turns in the course. As soon I got moving pretty well, then I had to brake & turn but that worked out when the wind was really bad on the back half. Some hills but not horrible. Not much spectator support but lots of awesome volunteers & the police did an excellent job of keeping the road clear for us. Last half of the course was significantly slower, back into the wind, plus I had some serious knee pain which is related to my back issues but still irritating. 3:21:15 bike split. I believe there were 4 aid stations on the bike. 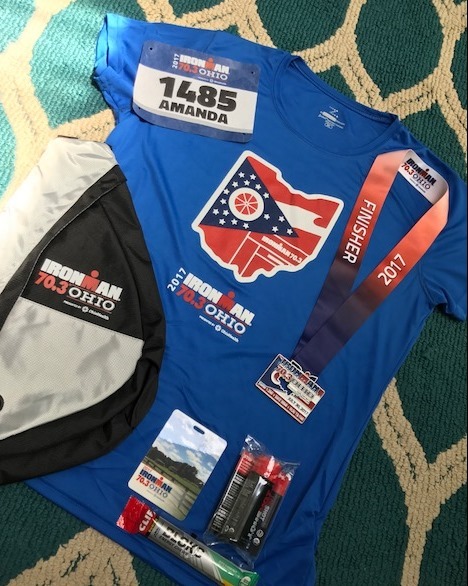 That’s one more than most IM 70.3 courses, if you’re counting. Time to run. I had Biofreeze in transition. Slathered some on the aching knee. Slathered more on my aching back. Off to run. I realized quickly that it was going to be a “long” run. I saw people running back to the finish and I was just getting started. That felt a bit defeating. I normally just focus on my race but there wasn’t a lot going on and it kinda felt like a training run. Not a lot of spectators out on course. The highlight was definitely the aid stations positioned at every mile. Such awesome volunteers. Aid stations were stocked with gels, power bars, powerade, bananas, coke, water & ice. One even had broth. I utilized the ice a lot and dumped some down the back of my tri kit at every aid station. Between the biofreeze & the ice, I was numbed out and just focused on one foot in front of the other. I thought overall the run course was cool. 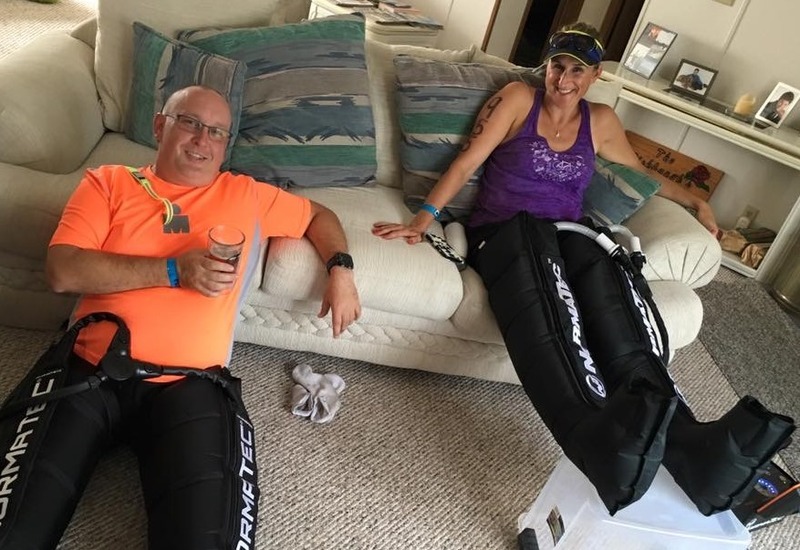 They ran us over the Cedar Point causeway, into town & back toward the water where we got to go thru a couple other marinas that had walking paths, bridges & one even had a swimming pool. We could even see Cedar Point across the water. The course did get a bit confusing for those of us on our first loop. The course wasn’t a full double loop but there was one section that had a double loop. I could see varying distances signs for the full and half that didn’t make sense. As soon as I finished the first loop, I was okay. The course was extremely well marked and there were volunteers helping direct runners. No confusion on where to go, just a bit of doubt initially that I had messed something up due to the signage. I won’t lie, turning away from the marinas & heading back toward town and the finish line made me one happy lady. I was ready to be done. I was ready to be reunited with my family. I just wanted to finish. Run split: 2:21. Finish 6:43. Swag bag is below & included a personalized note in each bag. A full sized towel from Gatorade. Rev3 Cedar Point visor. Gender specific tee. 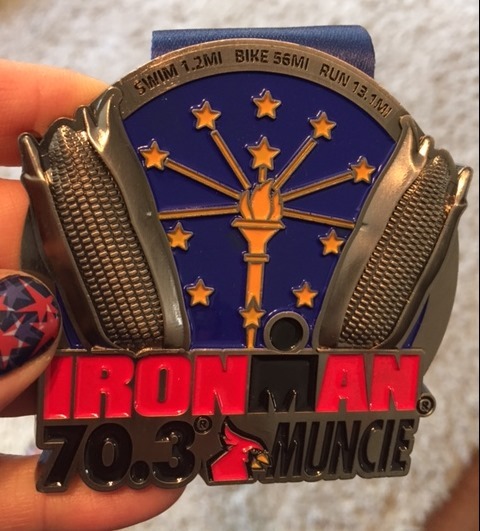 So, I know a lot of you are thinking about your first 70.3. 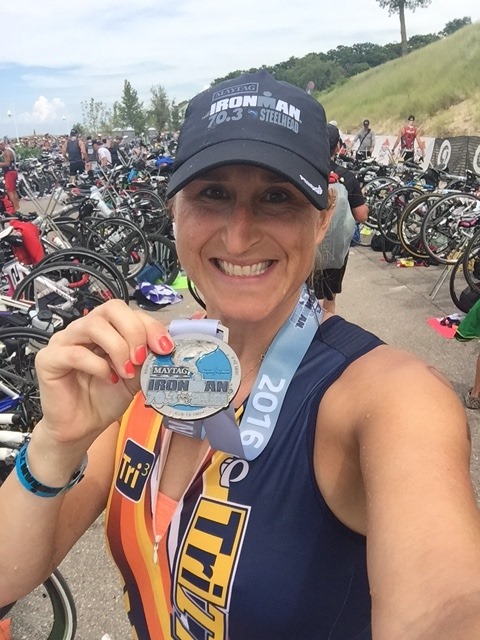 I get asked over and over again, Ironman or “off brand” triathlon for the first 70.3? The bottom line is that if we don’t do these off brand races, they just won’t be available in the future. In case you haven’t noticed, Ironman (World Triathlon Corp) is trying to buy up as many triathlon companies as possible. The non IM branded races are cheaper. Smaller. Less competitive. 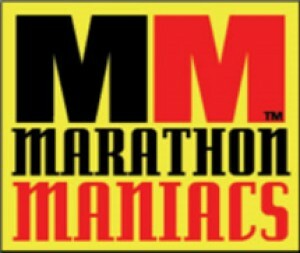 They are family focused & will most likely let you run down the finishers shoot with your kids, baby, dog or hubby. They will bend over backwards to make sure your race is as good as they can make it. And your fellow competitors will be there for their own reason, which probably won’t include attempting to qualify for the 70.3 Championships or up their position to All World Athlete status. If they bump you on the swim, they will probably apologize verses pushing you harder under the water so they can swim over the top of you. It just a different feel at these events vs an IM event. Way more relaxed. They try to personalize the experience for you. 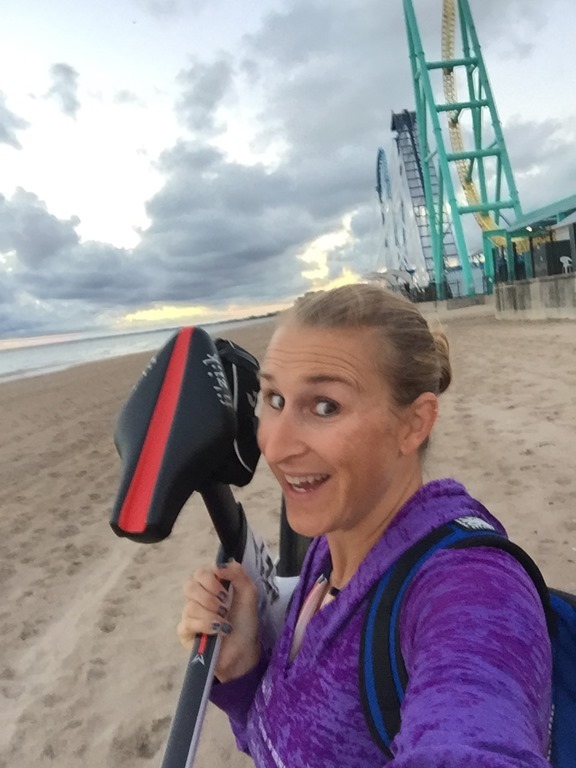 When I crossed the finish line on Sunday, the Rev3 announcer said my name, told everyone that I blog at TooTallFritz.com, that I’m a Marathon Maniac & that I’m currently attempting to run a marathon in every state. I would get lucky if my name were even announced at an IM 70.3 event. That being said, there would be people to cheer my down the shoot & along the course in an IM event and at Rev3, it was pretty lonely. I’m pretty sure Rev3 had more volunteers than actual participants and spectator support was virtually non-existent. 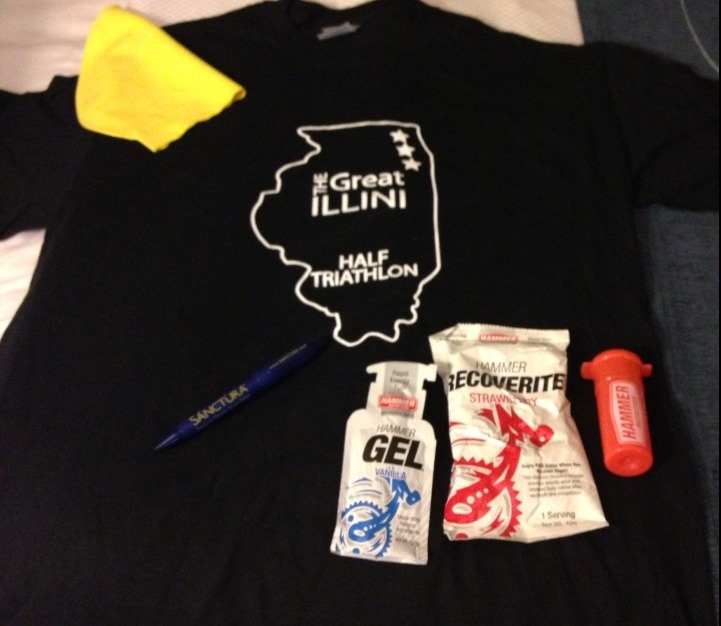 What do you get for your extra $$ at an IM event? Consistency. 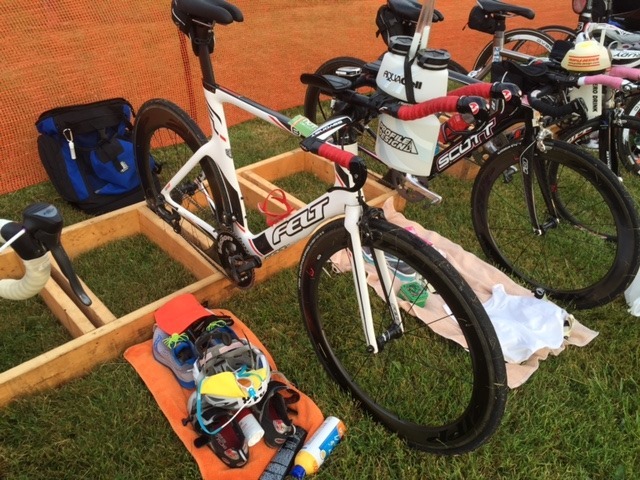 Accurate distances on the swim, bike & run. 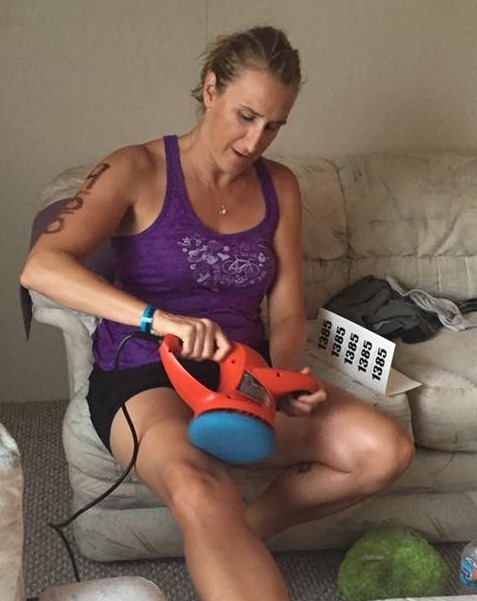 Accurate info in the Athlete Packet for race meetings, transition opening/closing. Larger group of competitors. Spectators. A community that is “all in” to support the race. Finisher swag. Free athlete tracking. 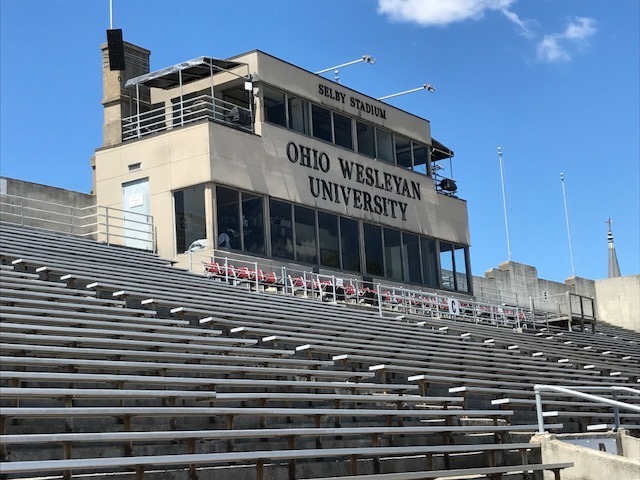 World class venue. Large expo. Insurance for the race registration in the event you are injured prior to the race, plus insurance on race day to cover any issues on course that may require emergency care. Numbered swim buoys: the first half yellow, the second half orange. 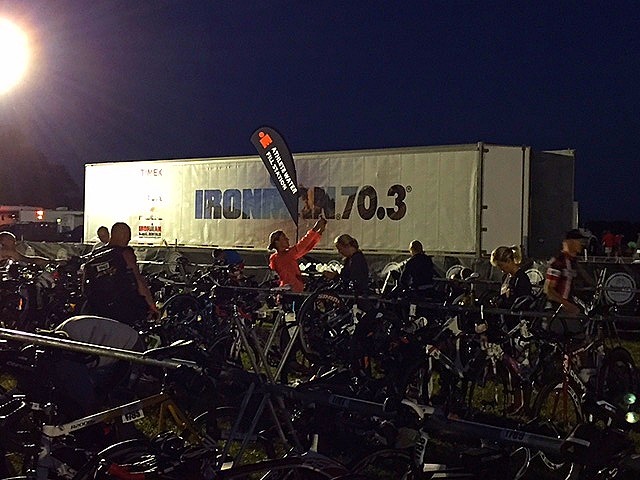 Ironman is like the fortune 500 company that is well polished & sparkling. Off brand races are like the mom & pop business. What’s right for you is really about what YOU want out of a race experience. I go both ways depending on the day. I was on edge all weekend with Rev3. Partially because I was rushed getting there with it being Cross Country & Soccer season for the kids. 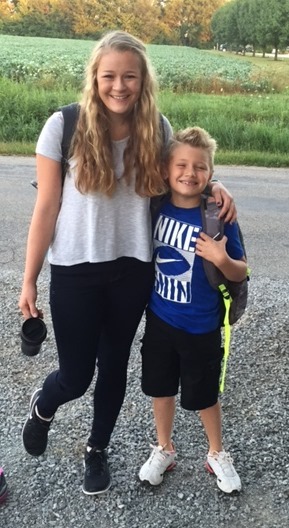 Both had meets/games on SAT before we could leave. I felt like crap with my back. It hurts to do the very basic things like sit, drive, bend over …… so I’m CRABBY and trying to pretend like I’m “fine”. Then I felt pulled between being with the kids at the park & doing what I needed to do for me & my body. The last minute changes that Rev3 had to make then put me further into crabbiness. BUT, nobody swam over me, ran over me or even bumped me at all during the race. And let’s just say my body couldn’t take anymore jostling. 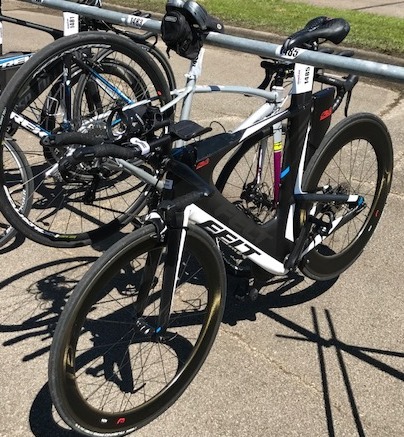 I was in the right spot with Rev3 this weekend and applaud their willingness to make last minute changes to keep the racers as safe as possible. I just wish I felt better and could have enjoyed it a bit more. 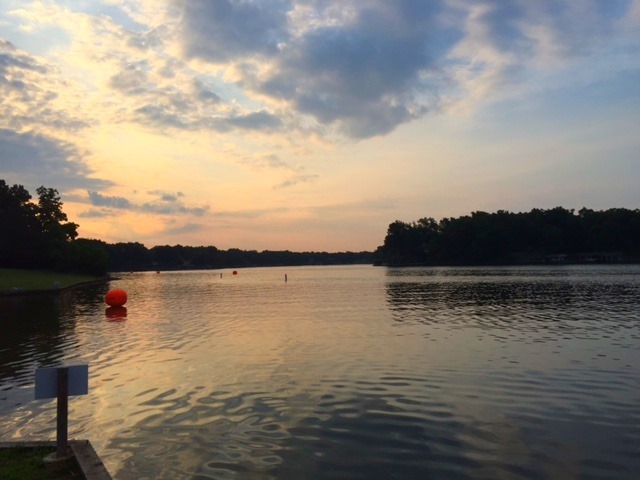 Rev3 offered a great race at a great venue. Great fun for the entire family. I hope that you give them a “TRI’. 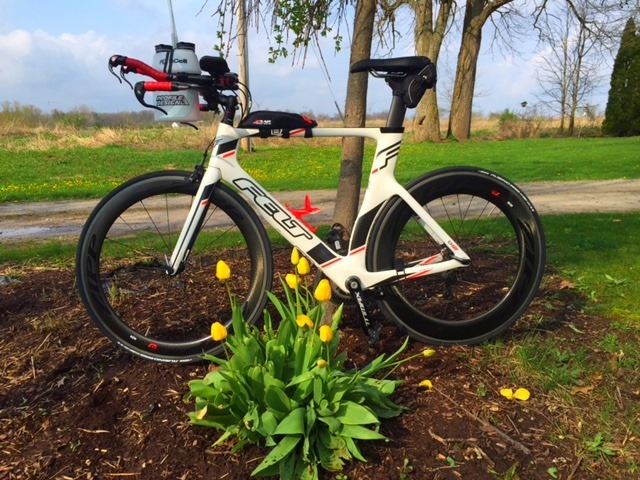 I’m 3 days out from the Rev3 Cedar Point 70.3 and I should be excited. This was to be my “A” race. I was hoping to go under 6 hours. I started my training in January & I was very focused. But the bottom line is that I was in better Swim-Bike-Run shape in May than I am now. I had a full season of marathons from January thru April, 6 marathons in that period, 4 were doubles (Back to Backs, SAT/SUN races). I was strong. Tired but strong. But in May, I “downcycled” to rest & recover. I rested. Then I was training more than racing, all easy paced. I was planning to refresh my legs and add some speed to my TRIs. I had registered for four 70.3s, one a month from June thru September. I knew the June race would be a bust. I would still be tired from the marathons. But I thought it was important to get out there and do my thing. Most would probably do a shorter race as a “rust buster” but I’m an endurance athlete. I gravitate toward longer races. It helps my mommy guilt to know that when I pack my bags its for a race that’s important to me. 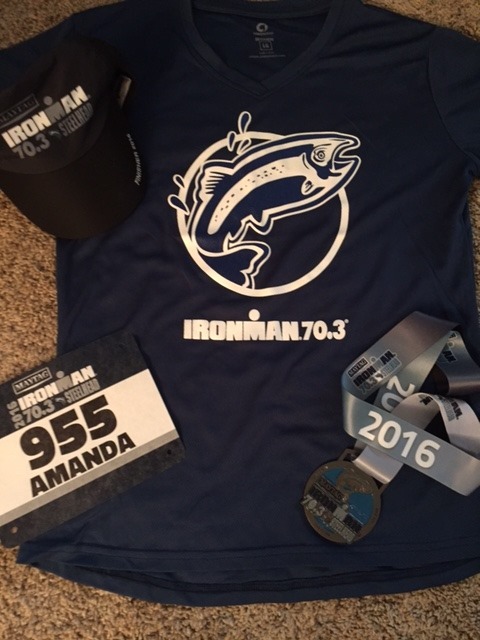 So the 70.3 or the “half ironman” has become my signature triathlon distance since Michael was born in 2009. 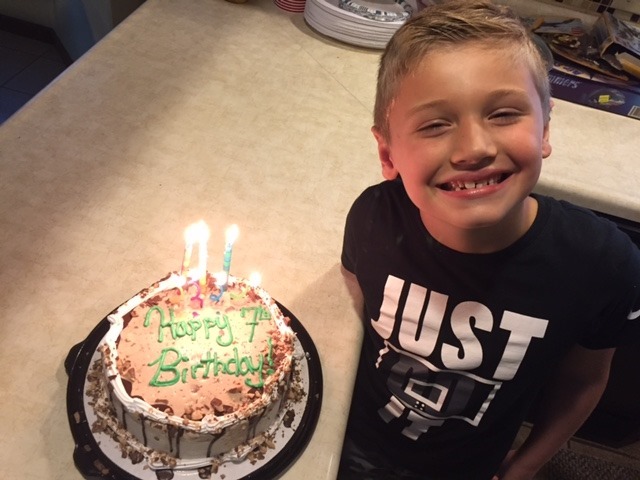 Baby boy just turned 7 yesterday!!! Happy Birthday, Michael!!! 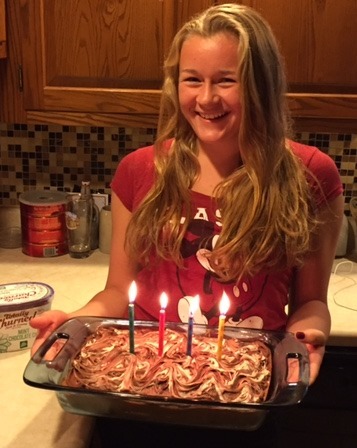 Aby turned 15, in late August. My babies are getting BIG!! If you have been following my sporadic posts this summer, you know that I’ve had a less than stellar season. My body hasn’t been right and the answer as to what exactly was wrong has been elusive. My quads have been constantly fatigued like I just ran up a horrendous hill, 2000x. My power on the bike has been poor. I lost almost 3mph from my 56 mile bike split. I have an ongoing glute/hamstring pull that has been lingering since November when I tripped over a crack in the sidewalk and bloodied myself. Then as the summer progressed the issues dominoed: hip, knee, back. 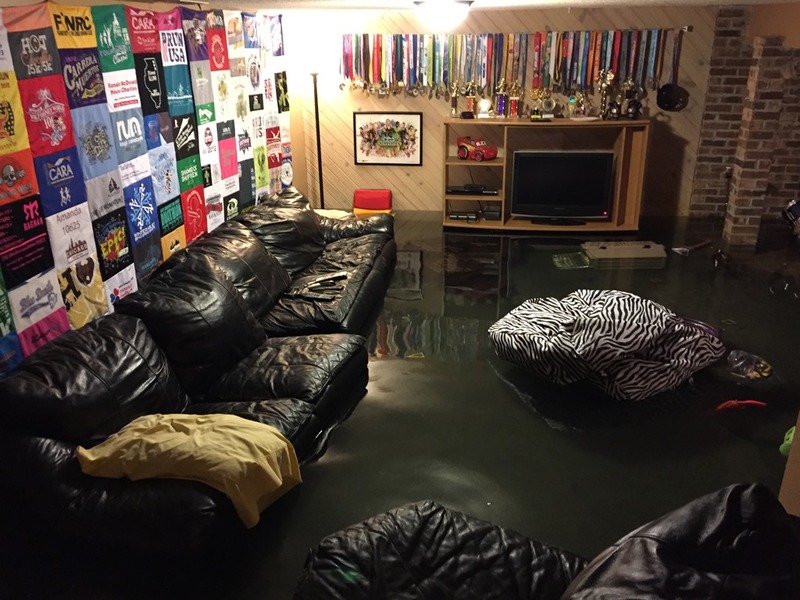 What you probably do not know, is that after my poor showing at the Cutting Edge Half 70.3 in June, I took some downtime to rest & recover & refinish the basement from the flood last summer. It needed to be done. I thought it would be good to do something other than swim-bike-run. Well, apparently I was wrong. 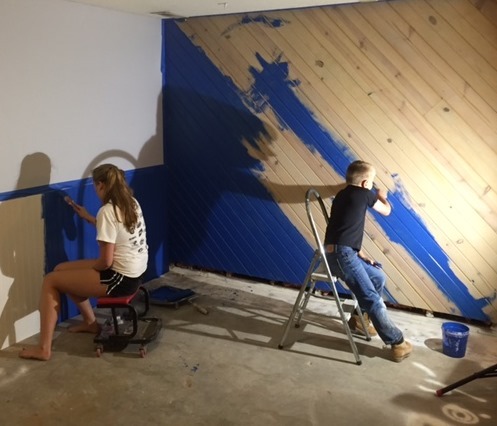 What could have just been fatigue turned into a real issue from all the bending, stretching, lifting as we turned our basement into useable living space again. 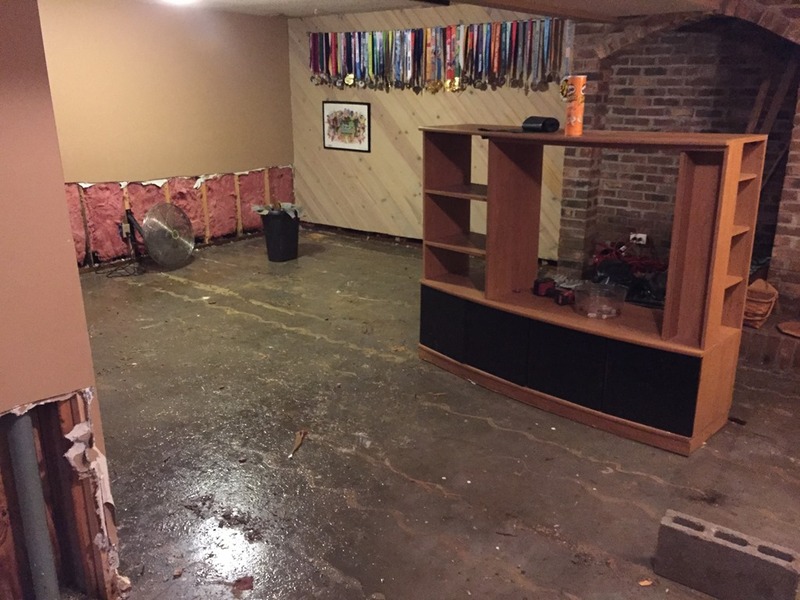 The basement as of June 2015. 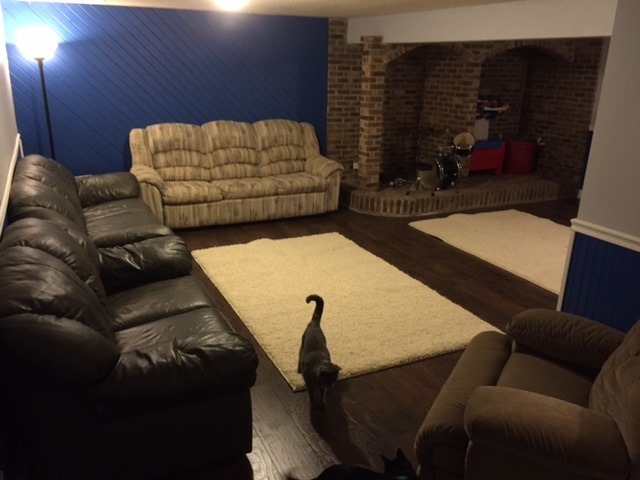 Yeah, our furniture & cats were floating. 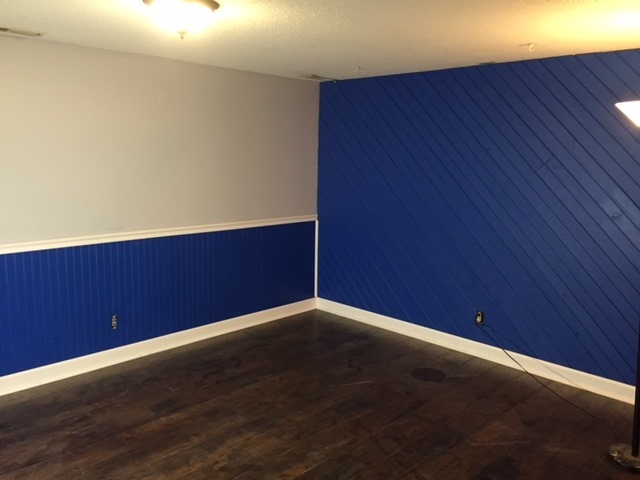 After all the painting, cutting & installing the floor (that Aby & I did all by ourselves), then moving in the furniture …… I basically couldn’t move. My back was in a bad place. It’s been bad before, thanks to an old college injury, but it just wouldn’t get better this time, not even with the Chiropractor & Active Release. My training slowed, my bike pace further plummeted. More rest. More recovery. Fewer and fewer workouts. Less and less sleep as the back just kept getting worse and I was miserable laying down. So, where am I now? One has been issue resolved. My bike has been repaired & is actually working. Yes! Thanks, Felt for sending new shifters!! The bike is ready to go! My body is still damaged. I still don’t have any power in my quads and feel like I’m riding thru sand. The theory is that the neurons in my back are not firing the message to my quads to do the work. My back continues to get worse. I can hardly bed over now. I can’t lift pots & pans out of the cabinet or bed over to pick something up. It hurts to swim, run, sit, lay down & drive. Ironically, it does not hurt on the bike but I’m still slow. I’ve been thru 5 sessions with a new PT. Not going great. X-rays have been taken. MRI was scheduled for today but canceled because insurance won’t pay until I’ve had 6 weeks of PT. Ironically, I’m worse now that I’m doing PT than before (which is what usually happens with me & PT). My GP is trying to get me into a pain specialist. His theory being that this isn’t going to go away. I ruptured discs in college while I was high jumping. I opted out of surgery in 1993 for a series of magical drug cocktail injections of steroids, nerve blocker & anesthetic. But alas, the magic has faded over time. Its theorized that the time is near for another series of injections. Until then, I’ll keep hobbling along. I haven’t been training much. I opted out of my run last night, the short swim-run brick this morning because I really just feel horrible. If there is any chance of getting to the start line on Sunday, I need to lie low this week. Fortunately, I’m done with PT this week & have a few days to heal. AND my therapeutic massage lady messaged me yesterday and said she had a cancellation for Friday. So I’ll go get a massage tomorrow and see if she can take some of the pressure off my back & put some power into my quads. Overall, my body should be fresh because I just haven’t been logging any miles. So that’s what’s up. I’m still planning to do Rev3 but my expectations are very low. And honestly, if I can’t do it, I just won’t. I’m already stressing over the thought of carrying my loaded transition pack. And water. I always carry a jug of water to fill my aero canister. I remember how badly it hurt my back carrying the water to transition for Steelhead and I’m much worse now than I was at Steelhead. I hate the thought of blowing off the money of the registration fee, so I won’t be a DNS but I’m just going to be realistic and see how the day plays out. 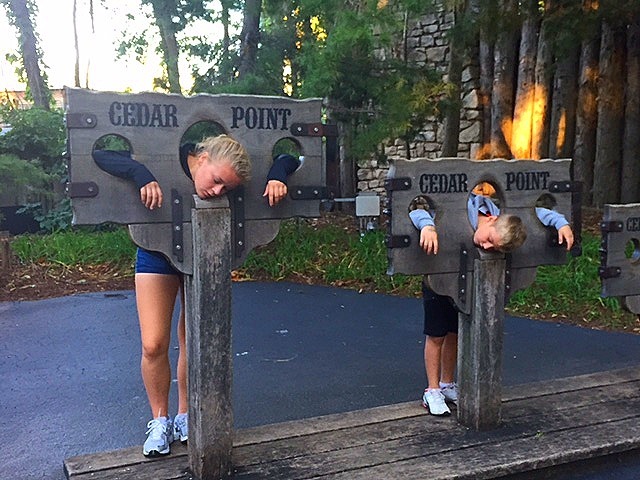 The kids are ALL IN for Cedar Point so at least there is that. I won’t be riding any rides but I can walk around and let them enjoy the park. Maybe, just maybe, the walking will take some pressure off my back. We’ll see. 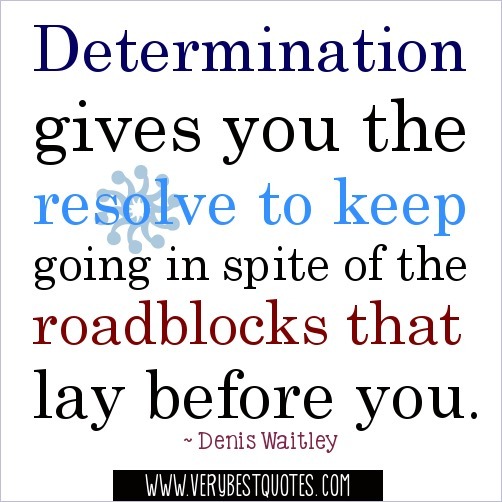 My power word for Sunday is DETERMINATION. 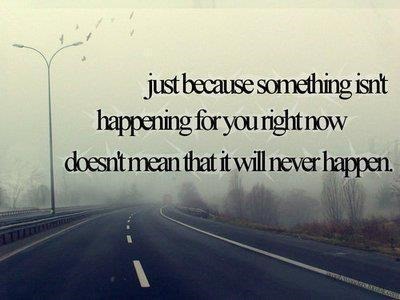 At this point, that’s what I need to focus upon. I’m determined to finish this TRI season with a smile on my face. 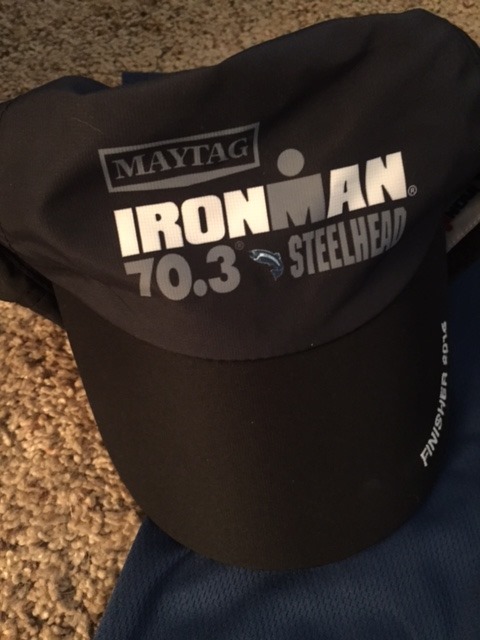 It’s no secret that Ironman 70.3 Steelhead is one of my favorites. In fact, I’ll sign up for 2017 as soon as the event opens for registration. Its “my” race. Its in a familiar place. I have friends in the area. And I love Saint Joseph MI. In fact, I raced this year, even though it was on my 17th wedding anniversary. Oooops. Sorry, honey. Or I should say, thanks, honey. 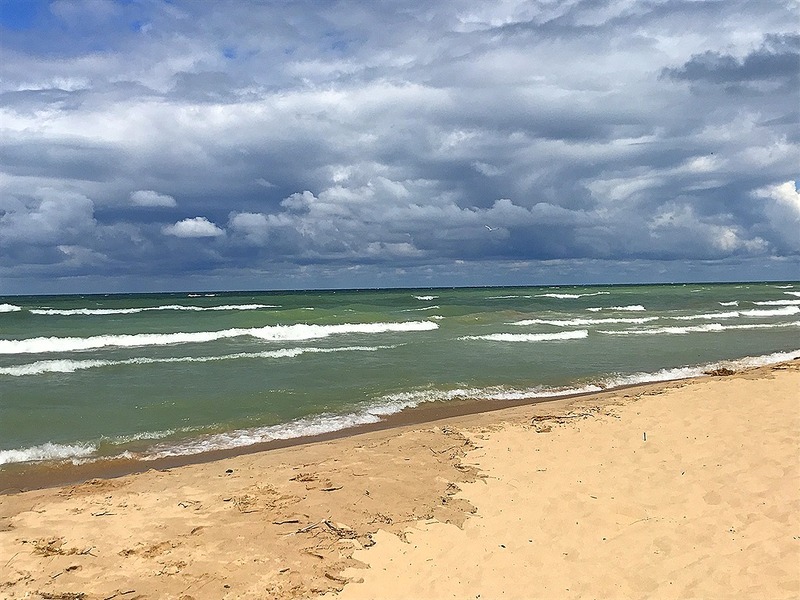 Steelhead is set in a picturesque, beach town on the shores of Lake Michigan. The venue is Jean Klock Park which has a Benton Harbor address, just one mile north of Saint Joseph, MI. The views are breathtaking and the park is public so you can go visit anytime. 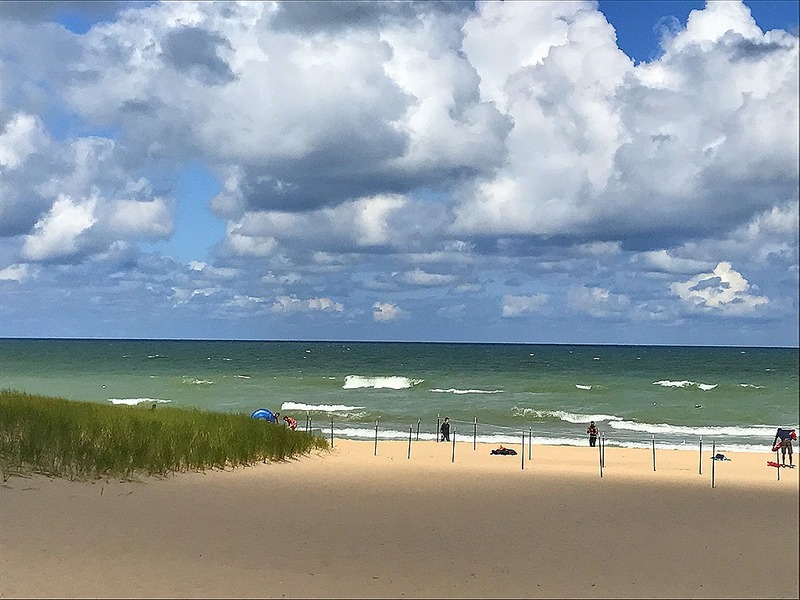 Take a swim in Lake MI. 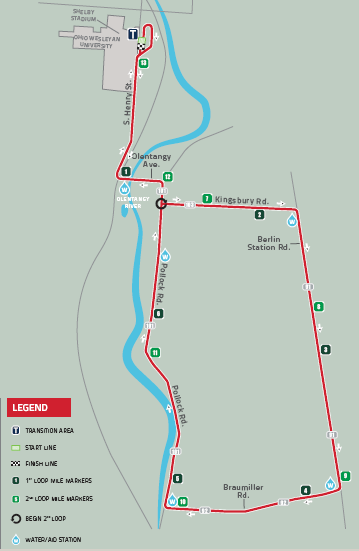 Ride the marked bike route. Go for a little run. Fun!! I arrived at Jean Klock Park for packet pick up on Saturday morning around 11am. It had stormed on me the entire 2.5 hours that I spent driving to the location. 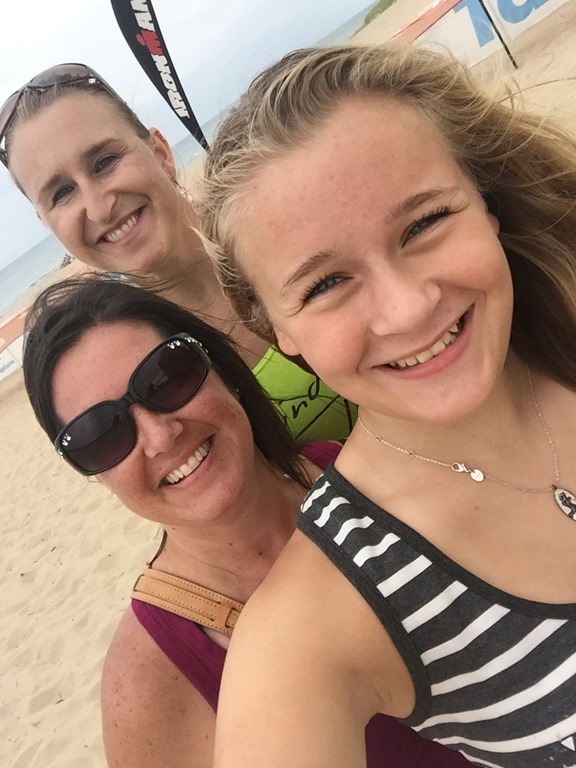 The sun was out on the shores of Lake MI but “something” definitely hung in the air. It was hot. The wind was blowing. And the waves were rolling. Looks like a perfect day at the beach but not perfect enough for me to rack my bike. I have been having issues with my bike all season, the gearing & derailleur, no need to leave it out in the weather overnight in less than ideal conditions. I quickly grabbed my packet, which isn’t as quick at an IM event as you might think. They are very organized but there is a process of checking identity, updating information & walking thru the various stations for bib/swim cap, shirt, & chip that takes a bit more time than a normal packet pick-up. Fortunately, I got thru just in time for one of the pre-race meetings. Always fun. Nothing had really changed from last year course wise, just a few rule changes. But then they dropped the big bomb that the water temp was almost to the point of being too high for wetsuits. Since it was a very warm day, we should stay tuned for a last minute call on if the race would be wetsuit legal. Honestly, I didn’t think much of it. 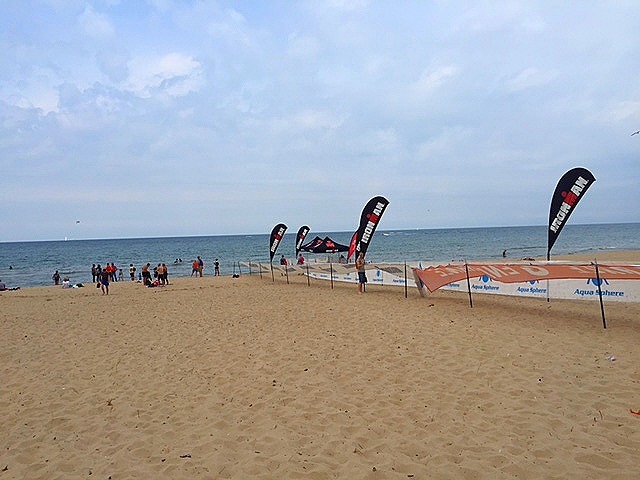 The swim is in Lake MI and I’m pretty sure it’s never NOT been wetsuit legal. The water stays pretty cool, even in the summer. Yeah, that’s what I was thinking. Packet picked up. Race meeting attended. Walked thru the expo quickly. Bought some TriSlide ….. cuz that’s the way to make sure you can definitely wear your wetsuit, have extra lube so you can get into it!! Found my spot in transition for reference. Off to check into Hotel de Jude (not a real hotel in St Joseph – I always stay with a friend). As the rest of the crew started filtering into Hotel de Jude, the air was light. Most of us were on a repeat trip to Steelhead and knew what to expect. We went about our business of cooking dinner, getting bikes ready for race day (cuz nobody from our group actually racked their bike), prepping nutrition & focusing on last minute rehab. I’m thankful for friends who have all the cool toys that I can’t afford and I took full advantage. 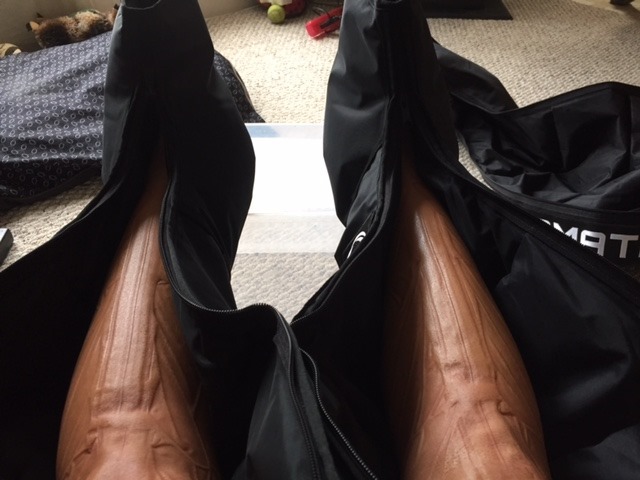 Normatec Recovery Boots? Yes, please! Ed modeling his boots, I’m using Ryan’s. Thanks, Ryan. If they go missing, it wasn’t me. I swear. Super compression from the toes to the hip. I’m in love. Left my legs looking very “compressed” and super scary! Car buffer to rub out sore muscles. I can afford that, $30 at Home Depot & I’ll be getting one soon! There are also high tech muscle “massagers” that are more official for a much bigger price tag. But this is essentially the same thing and much more affordable in my world. Weird sensation! I was all in on the recovery front. As a little background, I had spent the week hitting up the chiro and the massage therapist trying to bring my legs back from the dead. The Chiro has figured out that due to some low back damage from my college years, then a fresh round of irritation this summer, my low back muscles are not firing properly. My glutes aren’t working. As a result my quads are overworked and apparently underpaid cuz they are revolting. They are dead all the time. It is a struggle to even climb the stairs at home. When I get on the bike, all that is magnified and basically I’ve got zero power on the bike, despite better training and better nutrition. So, it is what it is and I have exercises to help correct the issue but it’s a slow process. I was hoping to have a great race at Steelhead so invested some extra time & $$ into recovery. Did it work?!?!? Race day is always early. The crew was up by 3am. Pre-race prep and we had to put Hotel de Jude back to its original state of perfectness. Off to the race site by 4:15am for a long day. We were rolling our bikes into the venue when we heard the announcement. Water temp was 77+degrees. NOT wetsuit legal, the cap for wetsuits at IM races is 76.1 degrees. The news did not hit the crowd well. In fact, I wasn’t real happy either and I know I can swim the distance without a wetsuit. It’s the waves. The up and down of the waves that slow us “recreational” swimmers. We don’t cut thru the waves but rather ride them up and down. The wetsuits help our buoyancy, confidence & swim split. But not at Steelhead 2016. No wetsuits. Transition set up quickly. Then we wait. 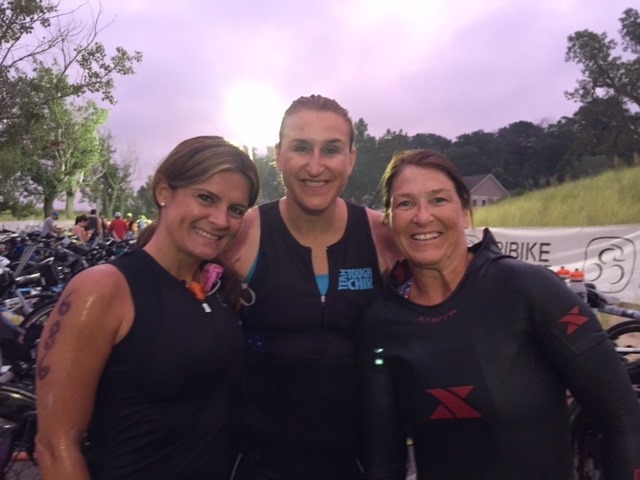 Donna, myself & Wendy waiting for transition to close at 6:45a and the race to begin at 7a. IM races always start on time. The three of us (above) were in the 40-44 category and our wave started at 7:24 am. The other ladies warmed up with a quick swim, I just stood on the beach socializing, awaiting my wave start. Lots of nervous people on race morning. The normal nerves were intensified by the “no wetsuit” call. I spoke to several people who had never swam without a wetsuit. Some who were so nervous they couldn’t hardly even speak. I felt bad for them and still wonder on how they did. I’m hoping once they got into the water, they just got down to business. The 1.2 mile swim course is very user friendly. 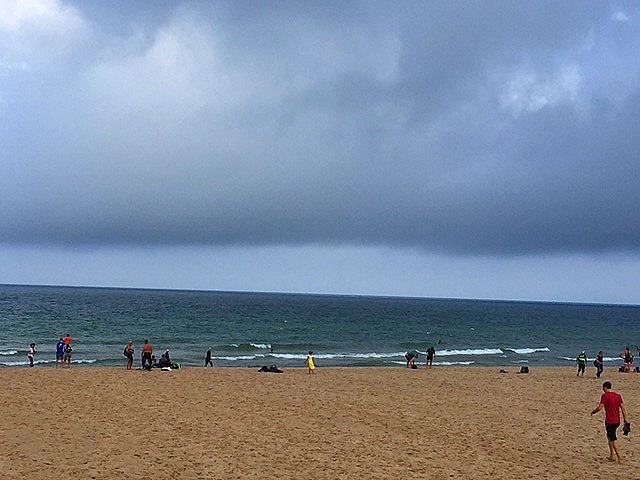 5 yellow buoys out, red turn buoy, 3 more yellow buoys, then 3 orange buoys (once you hit the orange buoys you’re half way), then a red turn buoy, then 5 more orange buoys to the beach. The swim was not easy but I’ve had worse. I’m not a fast swimmer even with the wetsuit so I was happy to see my swim split of 55 minutes once I got out of the water. That’s a decent swim for me, especially without a wetsuit & considering the rolling waves. The waves were rolling so high that spotting was difficult. Normally I don’t have to lift my head real high to see the next buoy but I wasn’t timing my siting correctly and each time I lifted to site, I could only see the wall of the next wave coming at me. Oh well, I just tried to be patient and focus on the next buoy. Just keep swimming, right? Made it out of the water with a smile on my face. Saw Valerie who had VIP access right next to the swim exit & she captured my happy exit from the water. Yay! Thanks! On to the bike and the real test as to if my attempt at recovery did any good. I knew within the first mile that it was going to be a long bike. I had 56 miles in front of me. And my quads felt horrible, very fatigued, just like every other day for the last 3 months. I’ll be honest, I was scared. I keep getting slower & slower with every race and I just didn’t want to have bad race at Steelhead when I love the race so much. Took me a minute to think but I basically had a realization. I remembered something that someone told me when I first started riding. They said, “when your legs get tired, pull UP on your pedals instead of pushing down”. So I refocused my efforts on pulling up vs pushing down and I had an instant turnaround in power output. I wasn’t able to harness as much power as last year, or the accompanying speed, but I did well with the new pedal stroke. This used different muscles and pulled power from my hamstrings vs my tired quads. Worked for me! 3:04 for the bike, 18.1 mph average. Best I’ve had all year and in case you were wondering, my gears did fail. I only had big gears. The shifter on the left side slid out in my hand within the first few miles. So I didn’t bother trying to use it, for fear of breaking down. I just used the big gears, pounded down the hills as quickly as I could, rode the wave of the up as long as possible, then I stood up from the saddle and rode the remainder of the hill when things got tough. I’m always willing to improvise to avoid catastrophe. 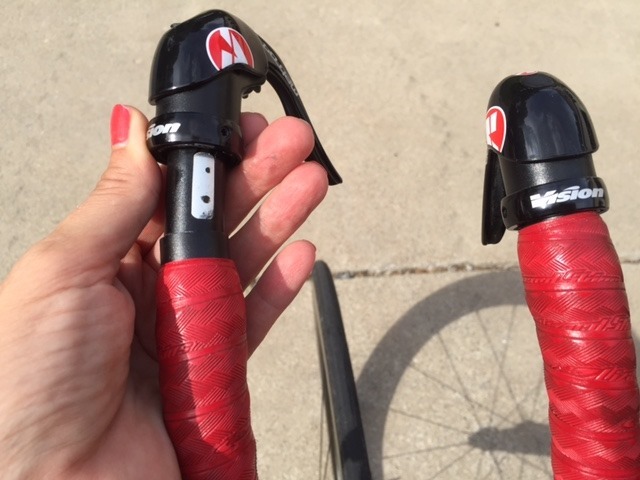 Side note – Felt send new shifters for me, so I’m hoping the next couple weeks of training (and REV3 Cedar Point 70.3) will go more smoothly. I want to toss out a huge thank you to the bike aid station volunteers. They always impress me so much. They are very attentive. We call out what they want, then they basically hold steady so we can grab water/gatorade/banana/gel, etc. Or they run with us for a second to help us connect with what we need. Nerves of steel! Thank you for being brave and so attentive. Pro Tip: Do NOT pass someone 2 seconds before an aid station on the bike. This goes double if you plan to STOP at said aid station to get something from the very first volunteer, after cutting in front of me someone 2 seconds prior to stopping. The way the aid stations work, there is always spillage from water & gatorade bottles. The ground is wet. I had to lock up my brakes at the very first aid station in an attempt to not hit a person who passed me, then stopped immediately. I didn’t crash. I didn’t hit him. But I’m quite confident the scenario could have easily gone a different way. I’ve been riding for a long time. There are a lot of people out on the course who are less experienced. We got lucky. Our race could have easily been over at mile 15 of the bike course. Thankfully, luck was on our side. 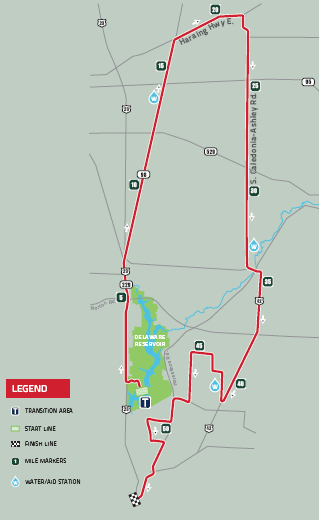 Bike aid stations – 3 – every 15 miles on the one loop, 56 mile bike course. Great layout. Great volunteers. Potties, food, fluids. Smooth roads the majority of the race. Well marked course (that is marked year round). 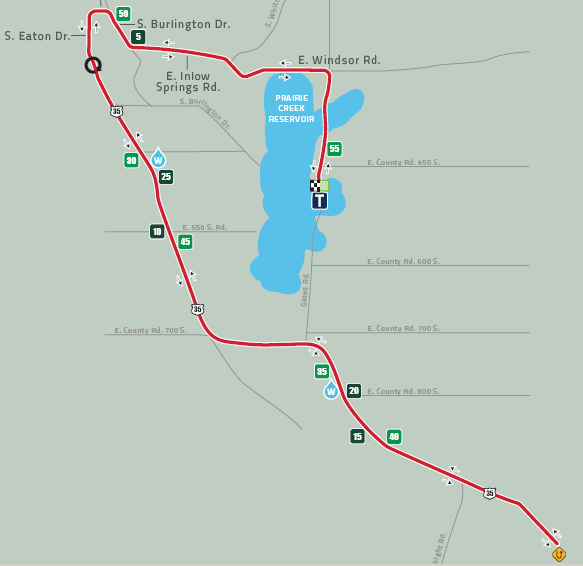 Run course – 2 loops – a couple decent hills. Aid stations every mile. Varying terrain, we even get to run some of the trails behind the Whirlpool Center! So cool!!! By the time we got to the run, it was really heating up. I definitely struggled but just focused on getting from aid station to aid station. Then I made sure to hydrate, take ice & just stay calm. Good run considering the heat. 2:23 for the 13.1 miles. Finish was 6:31. That’s 7 minutes slower than last year but to be honest, it felt like a huge win. I haven’t had a decent TRI all year. I’ve been fighting the good fight and focusing on getting thru the races to which I committed, but it’s been rough. Overall, the TRI Gods came thru for me and delivered a better race than I could have hoped for and I’m very grateful. SWAG – Cuz that’s what everyone wants to know, is great. IM does some of the best swag in the business. 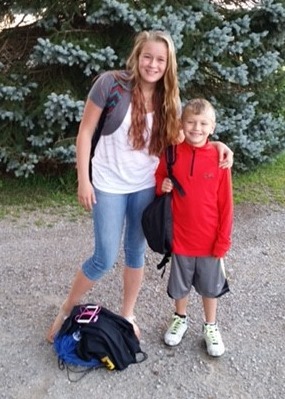 They went kinda cheap last year with the backpacks and the same shirt for every event. However, I think we all let them know that we were unhappy in our post race surveys. This year, the swag improved considerably. 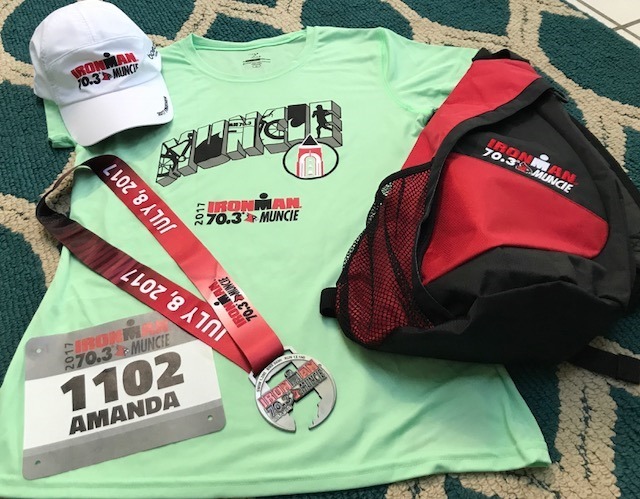 Different shirts for each race and the backpacks had the name of the event vs just a generic IM 70.3 logo. Yay! Overall, a great race. I love it. I definitely hope to make a repeat visit next year. 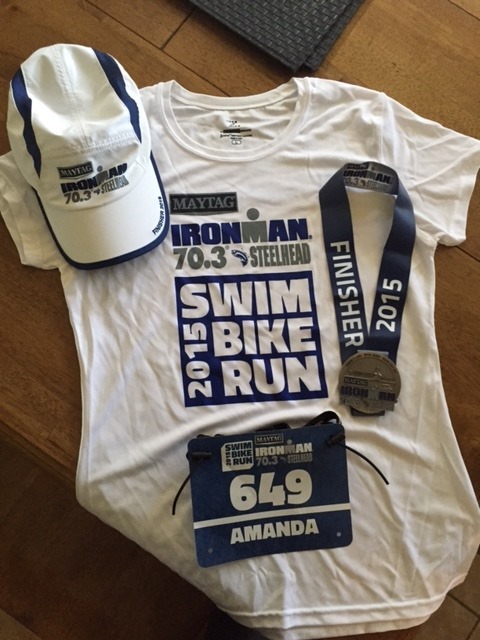 Here is my 2015 race report, if you want more info on IM 70.3 Steelhead. 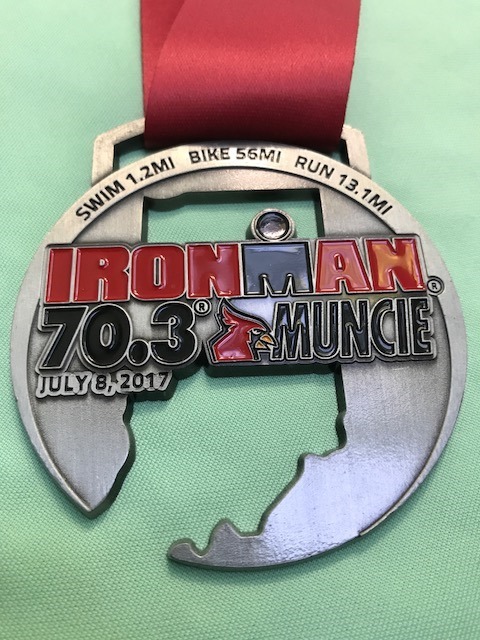 Last weekend was Ironman 70.3 Muncie. Close to home, within 2 hours of where I currently live in NE Indiana. 2016 is my second appearance at this event, the first time in 2012 just after I tore a tendon in my foot. 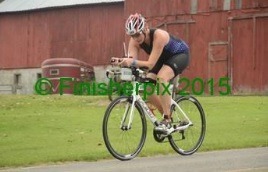 That year, I showed up to swim & bike, then I took a DNF since I couldn’t run. This year, my only goal was a finish. Little did I know, that’s all the cards had in store for me. Packet pick-up was at the race site this year verses the convention center like it was in 2012. Loved it! 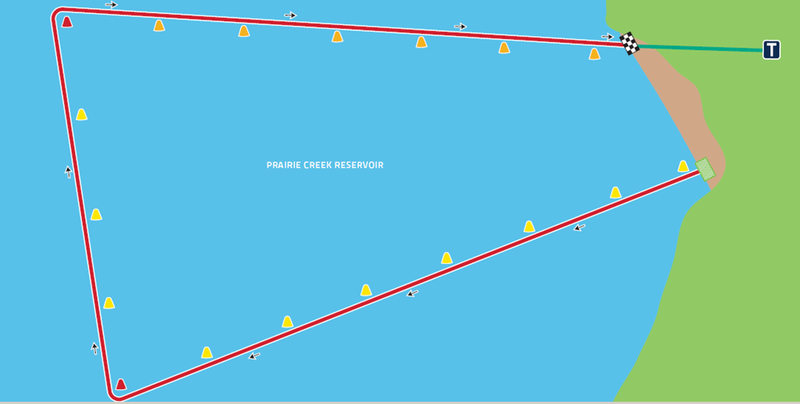 The race is kinda “out of the way” at Prairie Creek Reservoir. Definitely not a venue that you’ll stumble across unless you have Google maps loaded! It was nice to see the venue in the day light. I immediately noticed that the water looked calm & clean, despite the wind. I also noticed the site was much better groomed than it was in 2012. No pesky rocks this year. Lots of nice grassy areas. Clean beach. Yay!!! I arrived at the venue after 5pm because I was waiting for as long as possible to leave home so the kids didn’t kill each other weren’t home alone too long before hubby got home from work. I’m so bad about looking at the event schedule. And the last pre-race meeting was at 5pm. I realized this as I was picking up my packet. Good news, packet pick-up was fast since everyone else had already been thru and I was on to the meeting very quickly. Cool SWAG this year. 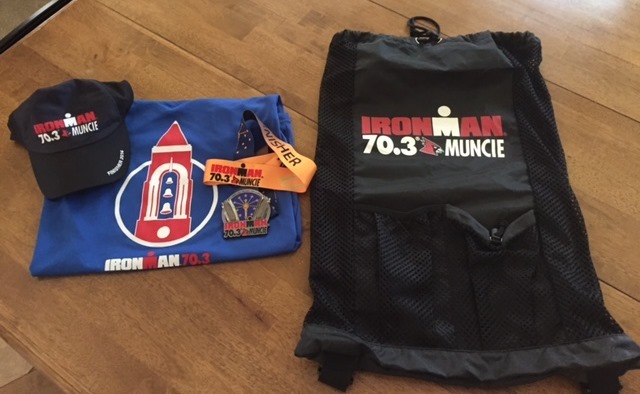 Ironman 70.3 Muncie backpack & gender specific tee, plus we got a Cliff Bar. This year they put the race specific logo on the bag & I really liked that. 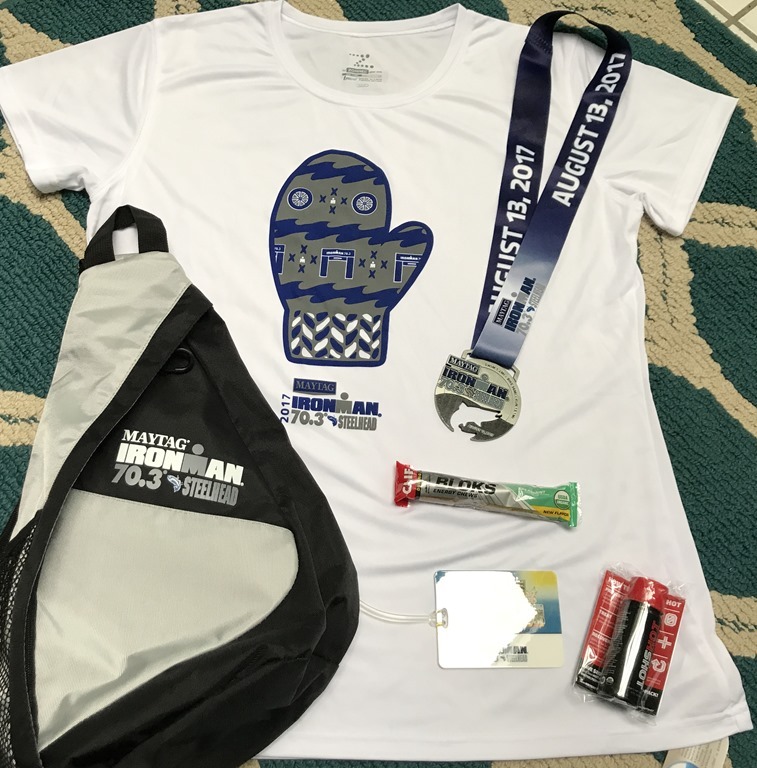 The last several years, IM has given out generic bags that just say “Ironman 70.3”. They in turn give that for each 70.3 event. 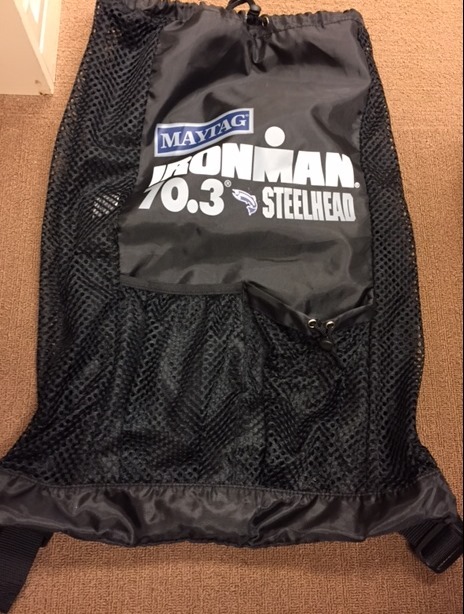 So if you do multiple 70.3 events, you get the exact same bag for each race. Boring. Happy to see the change for this year. Race day started early. Transition opened at 5am. Transition closed at 6:45am for a 7am start. I was concerned about parking so got to the reservoir pretty close to 5am and was happy I had cuz parking filled up very quickly. Set up transition quickly but it was still visibly dark. And visibly chaotic. 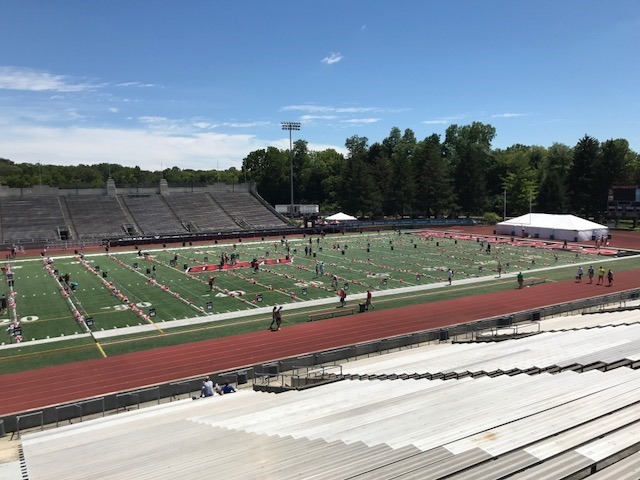 Hit the potties & was surprised that it looked like there were only about 20 potties for approximately 2200 athletes (and their families/friends). The lines were long. Like really long. Fortunately, I was there early enough to wait thru that line 2x. Hydrate much? Race started at 7am. My wave started at 7:59am. I believe there were 5 minutes between waves this year, which was a little better than the 3 minutes from when I participated in 2012. 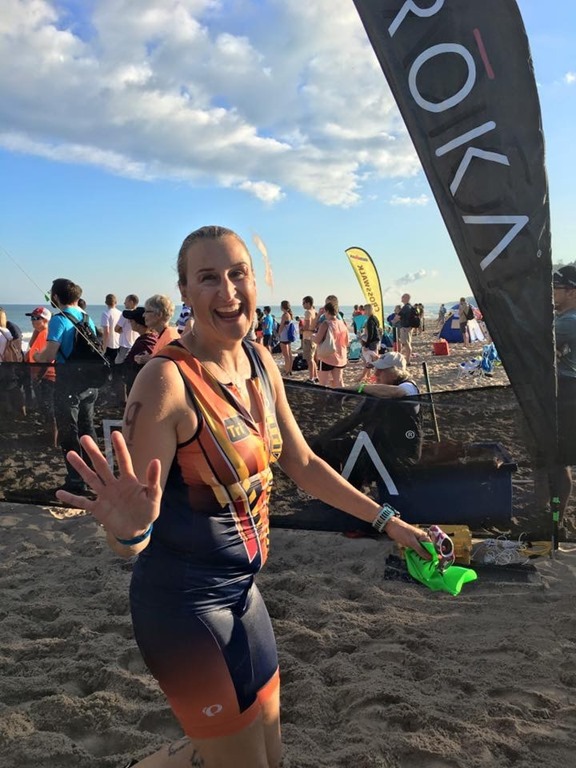 This event was not wetsuit legal, the water temp on race day was between 77 & 78 degrees, which is typical for this event. USAT rules do not allow wetsuits when water temps are greater than 76.1 degrees. No wetsuit, no problem. I must say, I was calm. I’m not a fast swimmer but I can swim for a long time. Like Dory, I “Just Keep Swimming”. Once in the water, it seemed cool & refreshing. Not much turbulence. I always start toward the back of my wave (cuz that’s where I finish the swim) and always get jammed up in the beginning. I may be slow but its inevitable that the breast strokers start ahead of me and I have to figure out a way to get around them. I felt strong on the swim. I was focused, stayed on course, pulled thru my stroke. I didn’t have the moments of panic that have visited in the past. It was difficult heading into shore on the last 1/3 of the course cuz the sun was in our eyes and I just couldn’t see the buoys in front of me. That resulted in me spending too much time checking my position but overall, I was happy with the swim and hoping my time would show as much. It didn’t. 50:30 swim for 1.2 miles. I was hoping for 45 minutes but overall happy cuz I was comfortable in the water and in my opinion that’s a win!! On to the bike! 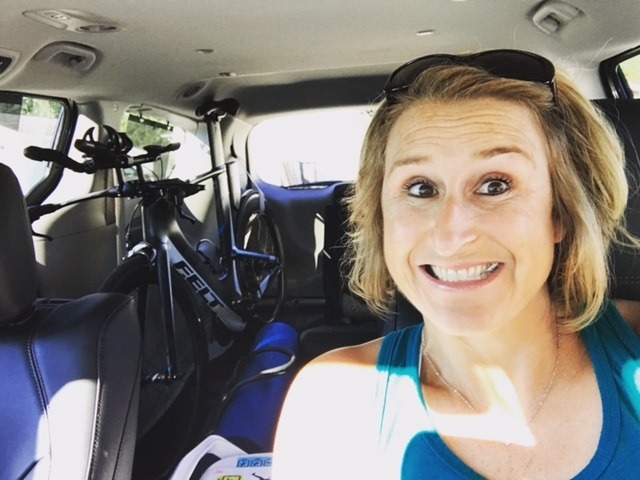 As I moved into transition, I forgot about the swim and started focusing on the bike. I was really hoping for a good bike split. 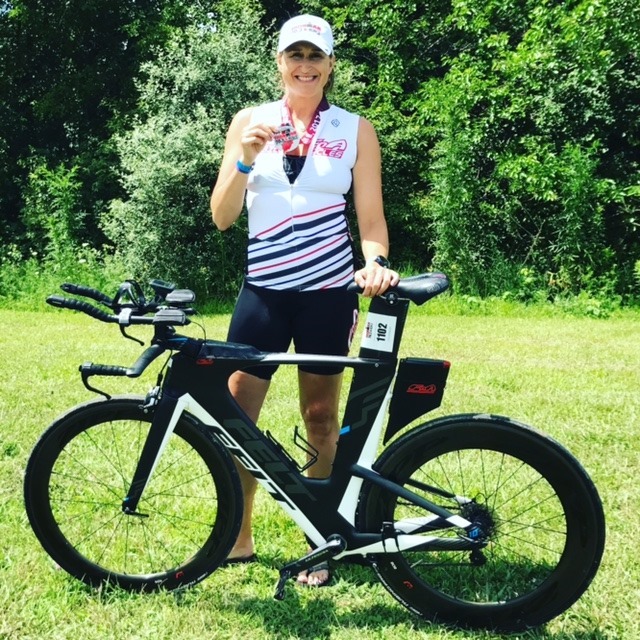 My last 70.3 at Cutting Edge in June had a slow bike split and I was hoping that was a result of 1) the high temps and 2) still being fatigued from my double marathon weekend at the beginning of May. I spent a lot of time resting in June, plus the temps at Muncie were much milder (70s & 80s). So I and hoping my time would show as much. It didn’t. I couldn’t get any power/speed. I wasn’t fatigued per say. 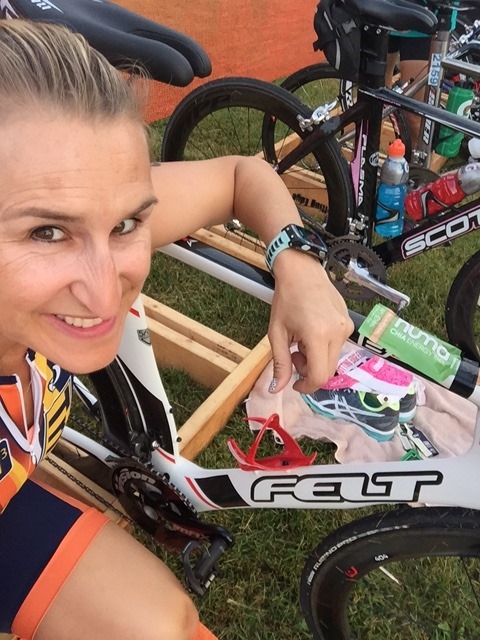 I was well fueled (thank you Tailwind Nutrition!!!). I was hydrated. I just couldn’t get any speed. Why?!?!? No idea. I’m not going to lie, I was frustrated out there. But I did see Sharon S. out on course & that probably the bright spot in my bike! She got the first pic below. 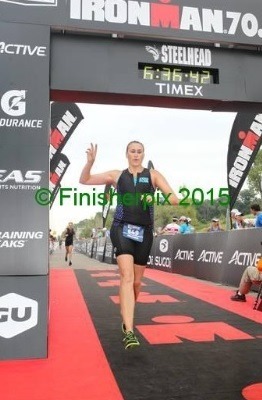 Second pic was from an Ironman photog. Great aid stations on the bike, every 15ish miles. 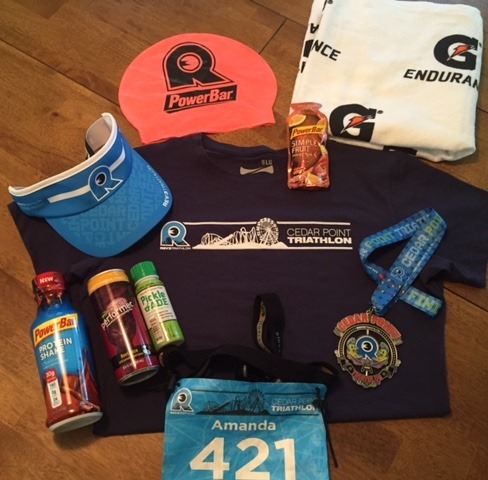 Food, water, Gatorade, gels, & potties. It always amazes me how steady & brave the bike aid station volunteers are to hold out the water or Gatorade so we can grab it as we zoom past. Then my bike broke. Initially, I thought the chain had just popped off, which was odd cuz that had never happened in the 3.5 years I’ve had this bike. But it wasn’t just that. My derailleur was also broken and my chain was jammed behind the brakes. It was stuck. Nothing I could fix roadside. At that point, I kinda laughed to be honest. I was already 38 miles into a poor bike split. I figured, if the bike is going to break, I was super thankful it broke on day when I was already having a subpar performance!! Then immediately, my thoughts went to “OMGosh, am I going to have to DNF this race AGAIN (like in 2012)?” Thankfully, I did not have to DNF. Ironman SAG support came rolling up after a short while. It took the dude a minute to figure out the problem, then he pulled out a giant wrench. He removed the crank arms that held on the chain ring so he could get to the chain. Fixed the chain, adjusted the broken derailleur and told me to take it easy and not shift much as I limped back to transition. That did the trick to get me back to transition! And my bike has been in the shop since Tuesday awaiting a new derailleur. Hoping to pick it up tomorrow. Anyhow, slow for me bike split: 3:40:39. I was hoping to go under 3 hours but I was WAY off that before I broke. I’m guessing that SAG found & fixed me within 20 minutes of the break, which is AWESOME. I could have been there for an hour or more. 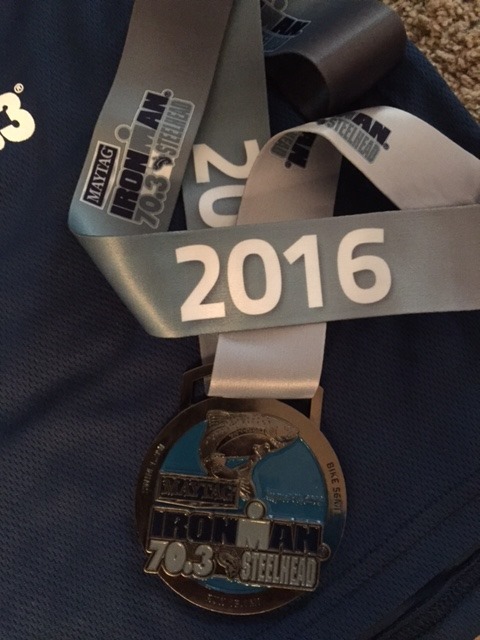 Thank you Ironman SAG!! On to the run. Smooth transition. Sprayed down with sunscreen again. Took off on the run. I had heard the run was hilly. That was accurate. At this point, I had nothing to gain by trying to rush, so I took my time. Didn’t stress about the hills. Or the heat. Just ran. Walked up the bigger hills Walked thru aid stations, which were every mile apart. Lots of run support. Great aid stations. Lots of potties. I tried to enjoy it. 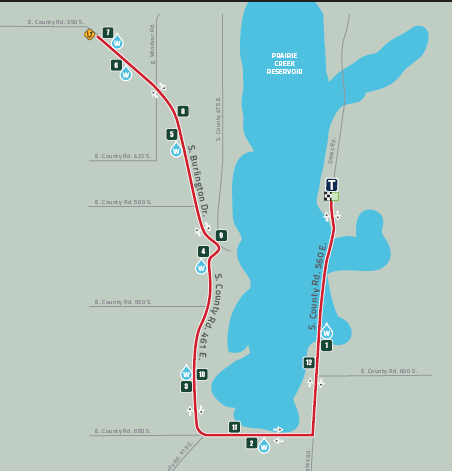 One loop run which is unusual for IM 70.3 courses. It was good. Got to the turnaround and cruised back at whatever pace I could manage without pushing. Run Split: 2:31:32. Total time: 7:09:20. Not where I was hoping to be but hey, a finish is a finish. 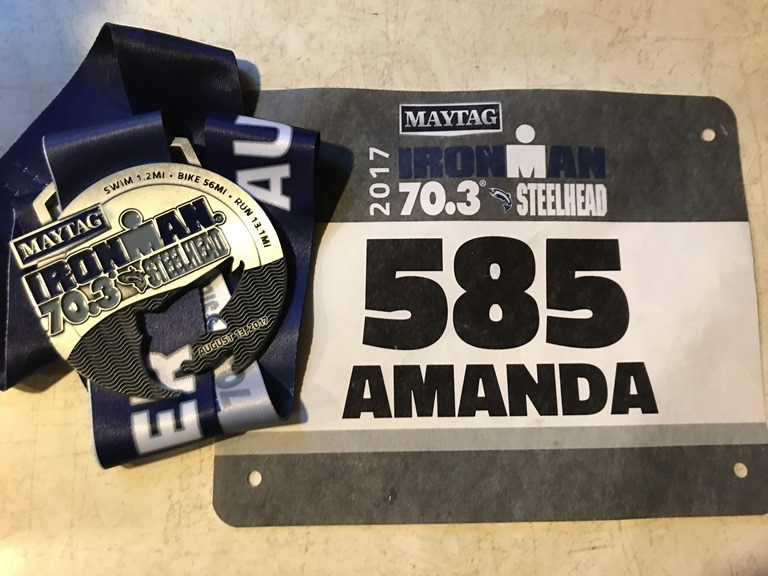 My goal for the year is to go under 6 hours for the 70.3 distance. If I don’t figure out how to freshen up these legs & find my power on the bike, that goal is going to be impossible. I’m also having issues with my saddle this year. I’ve swapped it out 3x already and just can not get comfortable (I’m flat out miserable). UGH. Hoping to get everything dialed in by Steelhead so I can make an honest attempt at the sub 6 hour finish. Only time will tell if that’s a realistic goal (for this year) but I’m focusing on me this month. Nutrition. Rest. Chiropractor. And I’m going to get a massage the week before Steelhead to try to flush out any nastiness from my legs pre-race. 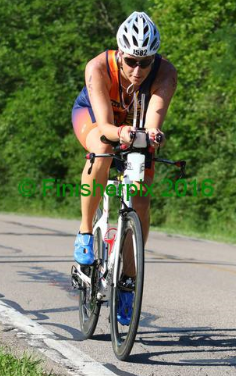 I must say, I was frustrated Saturday after my finish. It was not the race I envisioned but honestly, there are so many people who would give anything to be out there just DOING something, that I must thank my lucky stars for my health, my motivation and the constant drive to keep moving, even when life isn’t perfect. And who has a perfect life? 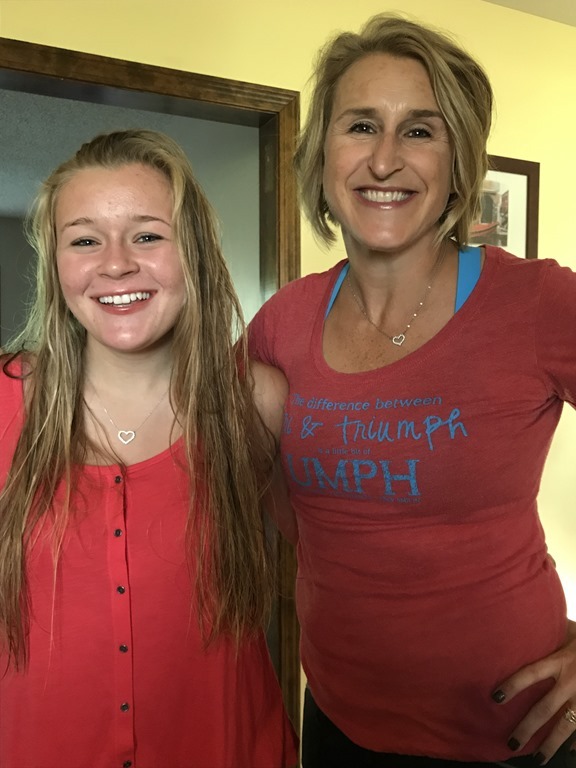 I, of course, have a lot to focus on other than my fitness but I continue to make fitness a priority while simultaneously managing the family, work and life. So that’s a WIN in my book. And the finisher medal to prove it. 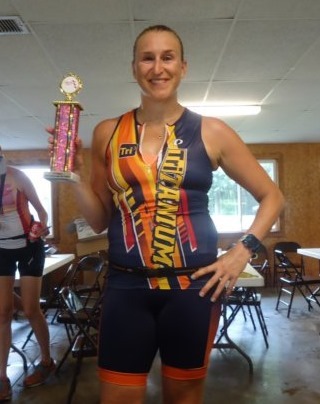 Last weekend I returned to Mattoon, IL for another multisport event. 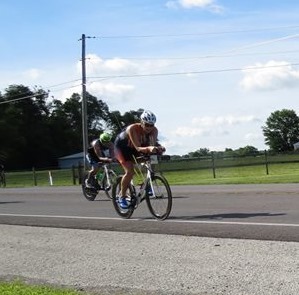 I have fond memories of Mattoon as my first ever multisport venue and also the first place I ever attempted the daunting 70.3 distance (2008). 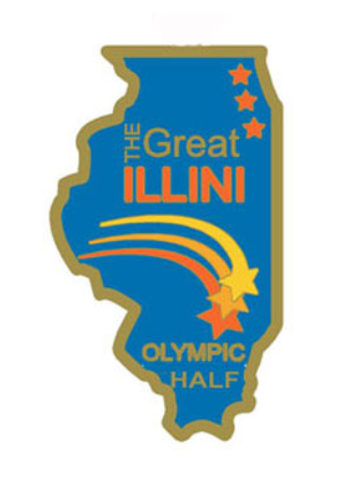 The 2008 Great Illini Challenge offered both a full and half iron distance race. I did the half. Great experience. I had hoped for a repeat last year but the event was canceled due to weather. All of the 2012 registrants then received a rollover registration for this year and although it didn’t really fit into my schedule I crammed it in anyhow still went so that I didn’t “lose” my registration fee. 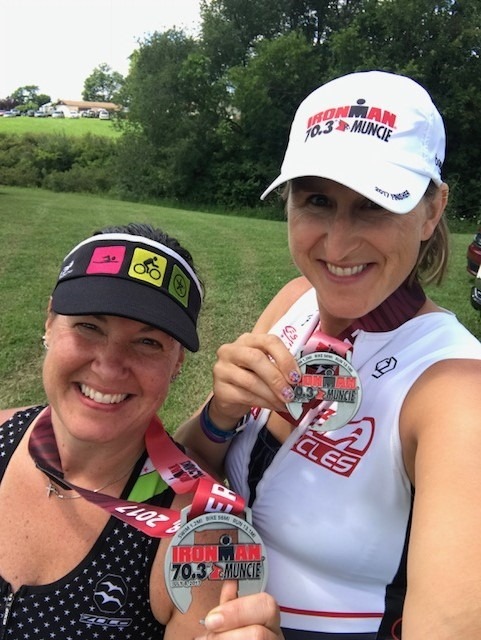 It also gave me something to look forward to after the 70.3 in Racine didn’t necessarily leave me feeling happy fulfilled on the half distance front. One of my favorite things about Great Illini is that it’s small and not branded by a particular company. 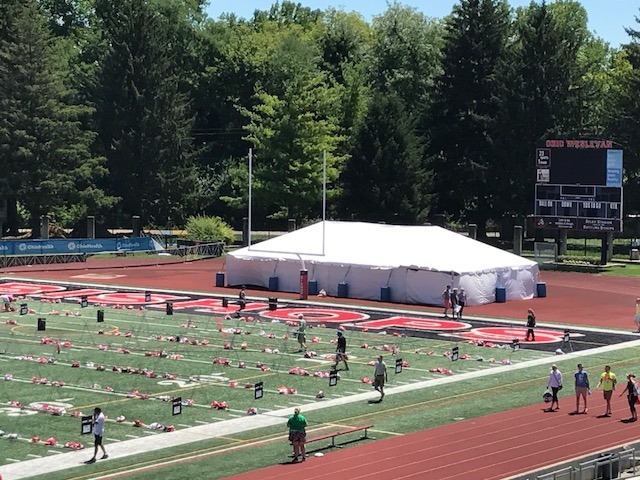 This brings a smaller field, a lower price tag and a majority of participants who tend to be a bit more relaxed and in it for fun and fitness rather than prize $$. 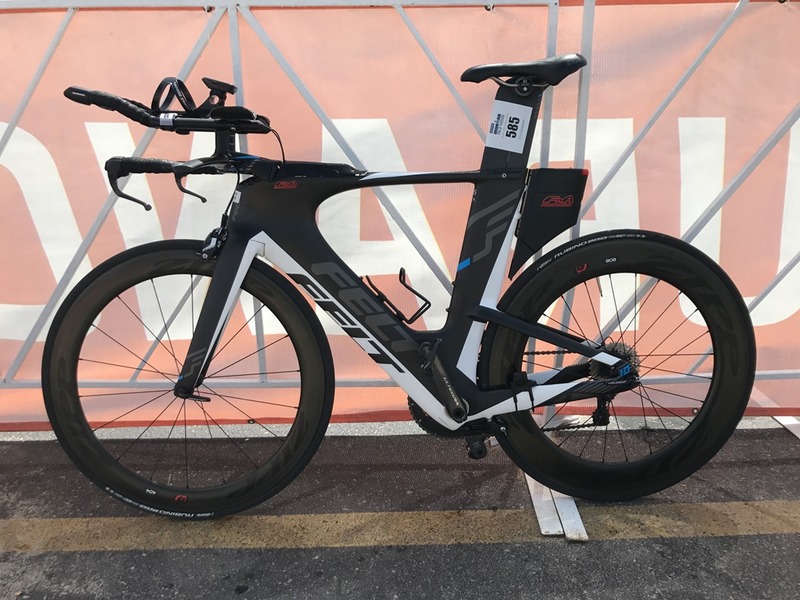 Your transition”mate” may be a new triathlete, an experienced racer who doesn’t buy into the “iron hype” or possibly someone looking for redemption from a less than ideal performance earlier in the year. I highly recommend talking to people and finding out what brings them to a particular event. 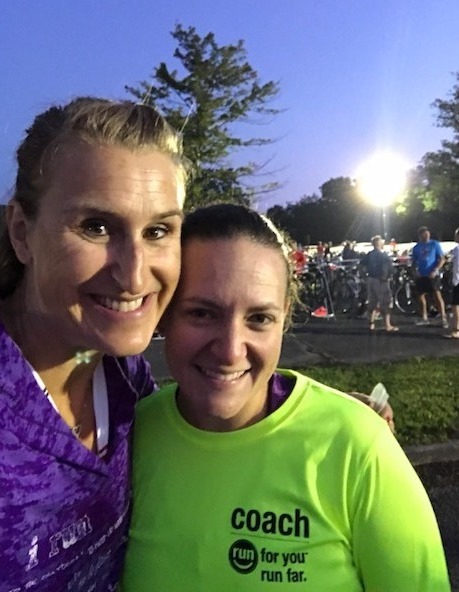 You just may find a bit of inspiration or last minute motivation that could propel you to a new PR! 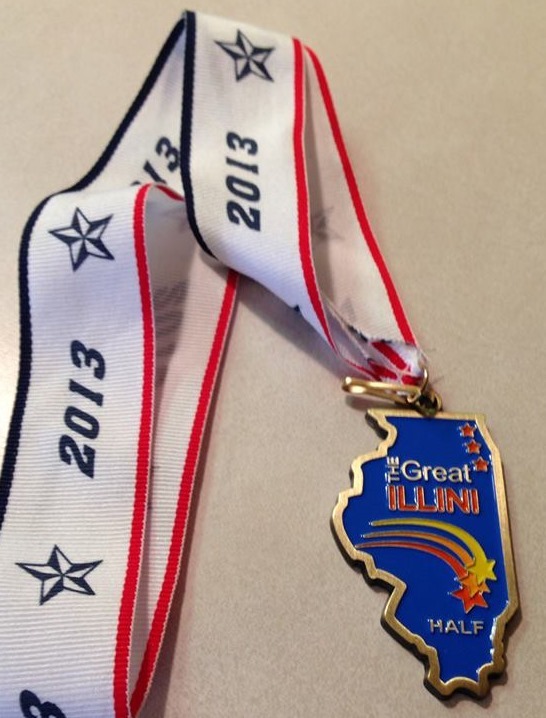 Packet pick-up for Great Illini was offered on both FRI afternoon/evening AND race morning. Takes a bit of stress out of the equation when you can pick up the packet on race morning. The first thing I noticed when I arrived at the venue was the nice, calm water in which we would swim. Lake Mattoon. Then I asked about the water temp and was told it was 82 degrees, which is not wetsuit legal. Bummer. In less than 3 minutes, I had signed my waiver, picked up the packet, walked to the beach to take the above photo look at the water and was back in my car and on the way to the hotel. It really doesn’t get any easier than that. Swag – black cotton unisex tee, swim cap, pen, Hammer Gel & Recoverite and a small Hammer canister which I assume is to carry an electrolyte powder. Please note that this is swag for a $135 half distance entry free vs a branded race which “may” cost up to $250. Big difference but how badly do you really need that nylon backpack? Race morning was just as smooth. Transition opened at 5:30am, race started at 6:45am. I picked up my chip and was thru body marking in less than a minute. 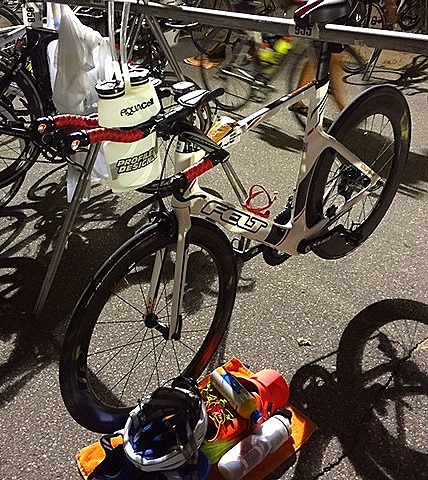 No bibs for less hassle faster transitions. I parked less than a 100 meters from transition and was set up in no time with plenty of space and friendly people all around. I was able to use the bathroom without waiting. I attended the pre-race meeting, heard that wetsuits would be legal so just walked over to the car and grabbed the wetsuit. No fuss. No stress. No worries about missing the start because I needed to hike a mile to my car. Very relaxed atmosphere and I was very thankful to be back at a small venue. 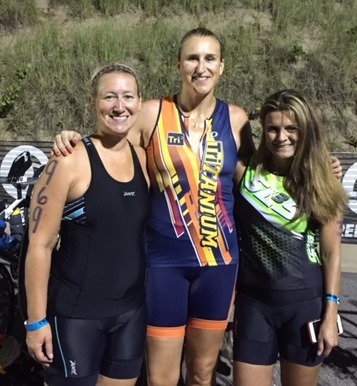 I was even able to catch up with a couple of friends who were also participating, including Jen who was tackling her first Olympic distance event! Yay, Jen!!! Then it was time to roll. The event was a double loop course on all fronts: swim, bike & run. 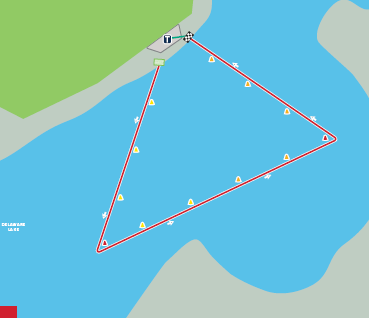 The swim course was marked by 5 orange buoys which were set-up in a “somewhat” rectangular pattern. Two waves, men first and then women 3 minutes later. Worked perfectly. The sun was in our eyes initially (and when we re-looped) but everyone was calm, nice and although I did bump into a few people, I was able to just move a bit and then had plenty of room to swim. 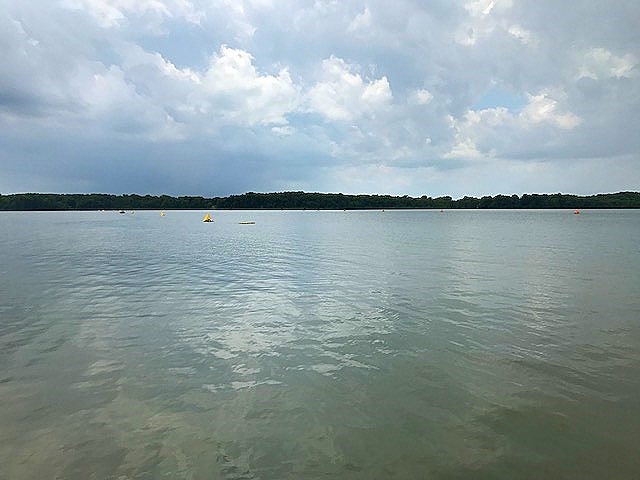 Very calm and relaxing swim in clean lake water. Nice! I was a bit surprised when I got out of the water at how long it took me to move thru the 1.2 miles but whispers around me told of a long swim course that was just at 1.4 miles. Okay, that makes more sense. The bike course was also a double loop. Aid stations were pretty frequent, probably 3 per loop and also at the turnaround. Each time I went thru they handed me a generic bottle filled with water which I squeezed into my aero drink canister then tossed. I also saw bananas at the half way point but didn’t have enough time to grab both water and a banana. Aid stations were small & tight. 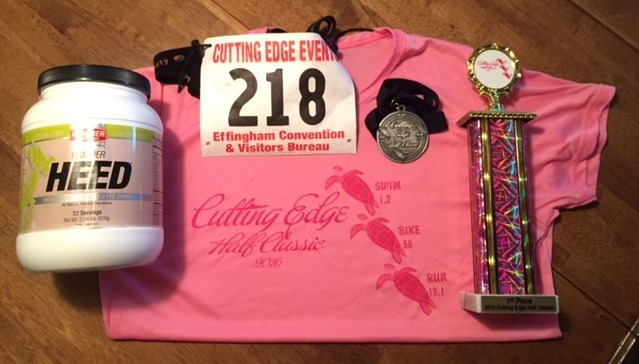 The race had advertised Hammer Gel and an electrolyte drink to be on course too but I never saw (or was offered) either until I stopped at the last aid station and asked. By this point the heat was high and the volunteers were pretty melted, some sitting, some standing in a wilted position. They were stationed out on country roads, beside corn fields with zero shade in an effort to support us on the bike. 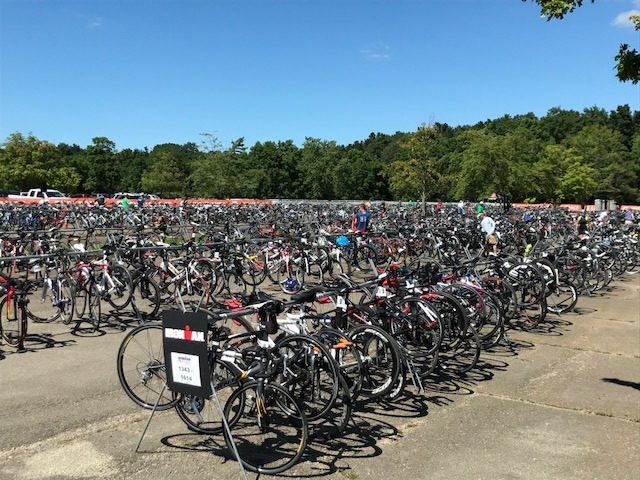 I was moving, and had a bit of a breeze from the bike, but was really struggling with the heat so I felt really bad for the on course volunteers who were standing out there waiting for us! Personal Note: My bike segment was slow, like really slow. Decent speed in the first hour but the heat started getting to me pretty badly in the second hour. I used two of my own gels in the first 30 miles, then stopped for a third gel at mile 44 (aid station). I knew electrolytes would be absolutely necessary if I had any chance of finishing. To be honest, I wasn’t feeling good on several fronts and by mile 30, I was ready to go back to transition, pack up and head home. The sun and high temps were melting the tar on the country roads and I could hear a “sticking” sound coming from my tires as they pulled up from the tar on each rotation. I was hot. Very hot. The breeze from the bike was stifling and the hot air in my face was miserable. To add to the heat misery, I had a very bad headache. My vision was a bit blurred from the headache (or maybe the heat?) and I had so much pressure in/on my head that I actually loosened up my helmet in an attempt to give my head some relief. Didn’t work. The run course. Two loops. Out and back. Flat country roads. Full sun. Some gravel. Lots of melted tar. 3 aid stations which we hit x2 on each loop. They offered cold water, ice, coke, pretzels, Hammer Gel, & Heed electrolyte drink. The volunteers had tents but I still felt horrible for them being out there that long. However, they were all VERY KIND, let me stand under their tent for a bit of shade and were super helpful. Personal Note: I couldn’t run. I was beyond hot. My legs wouldn’t move. I wanted to quit. A lot of people did quit. I finished but it took so long since I couldn’t run that I might as well have signed up for a full iron distance race. I’d say this was a “personal worst” but that would absolutely minimalize how horrible it went. Not looking for a pitty party here, I’ve already covered that, just stating the facts. 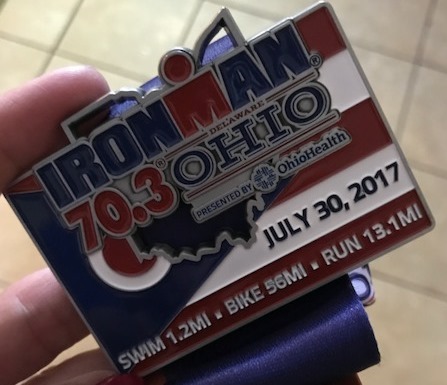 I did finish and only 54 other people managed to do that for the 70.3 distance. As I look back, I did a couple things right. Since it’s always nice to end on a positive, I’ll share. 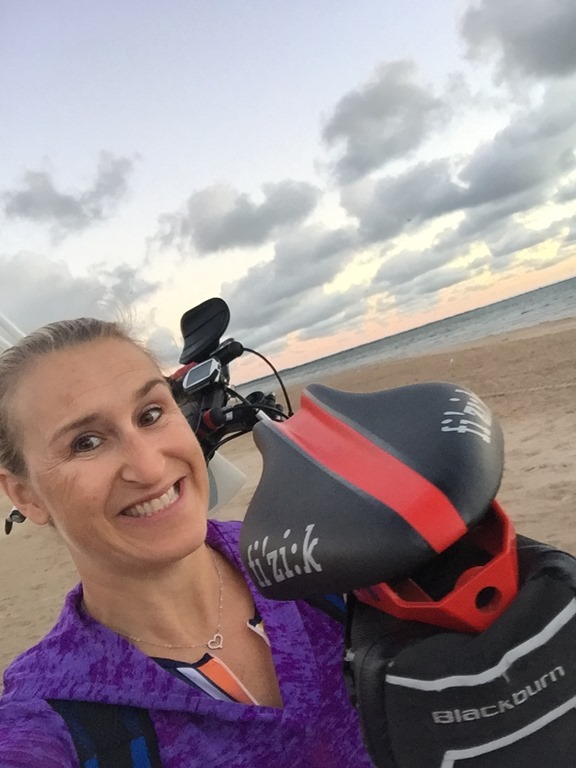 1) I left my spray sunscreen in transition and resprayed myself when I got off the bike. I do have some wicked tan lines but I’m not burnt. 2) I hydrated, hydrated, then hydrated some more. I wouldn’t have had a chance had I not consumed so many fluids before the race and also during. The ice helped a ton too. I chewed a lot of ice. I also stuffed chunks of ice into my clothing. 3) I used extra gels. When the heat is high your body will process fuel faster. You’ll need extra fuel. I always tell people to take more fuel then they really need. I should have listened to myself but fortunately was able to score extra fuel at an aid station. This is a good race. Although the thermometer in my car read 101 when I finished the race, this should not reflect on the race itself. Good race. Good venue. I do think organizers should have called off the race for the safety of the participants. Some people will refuse to quit and you have to call it for them and for your insurance coverage but I am pretty sure the race director was “afraid” to call it early since the race had been canceled in 2012. Reputation is everything and if people don’t get to finish sometimes they get mad. Then they talk. I understand. 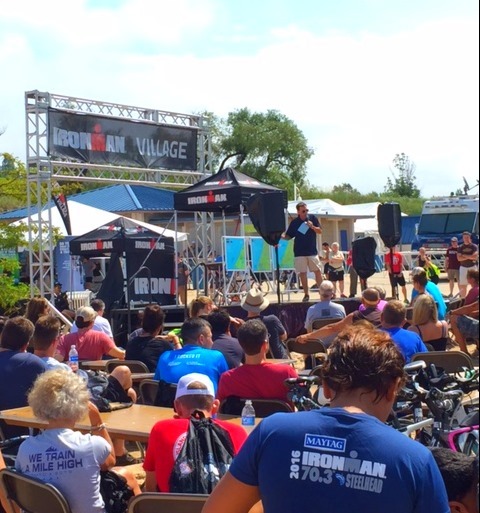 I highly recommend giving a smaller venue a TRI. See what YOU think. It may not be big and fancy but it will most likely offer a quality race for a much smaller price tag. 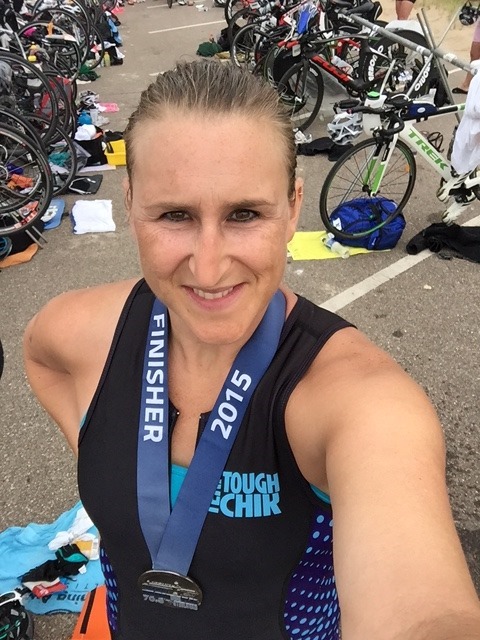 It may even be a refreshing change from the monster TRI you’ve already done 10x.